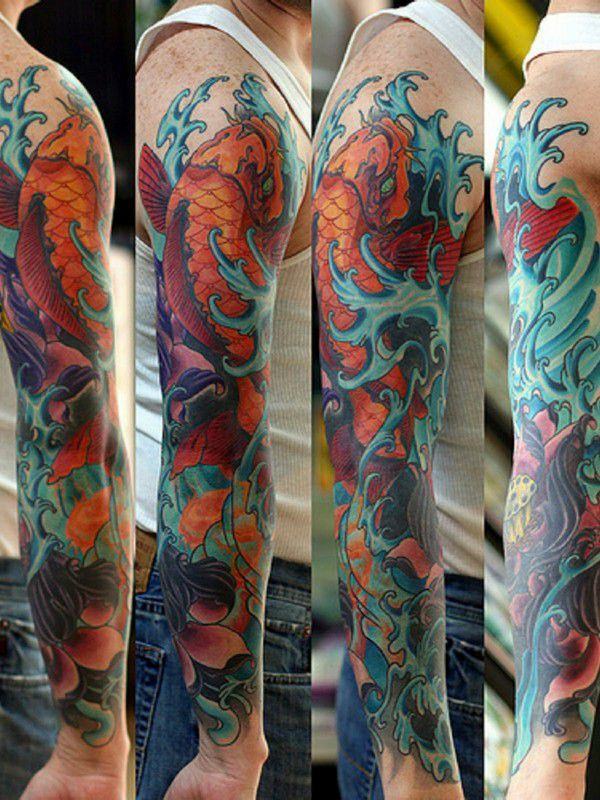 120 Jaw Dropping KOI Fish Tattoo Designs & Their Meaning - Picnic! 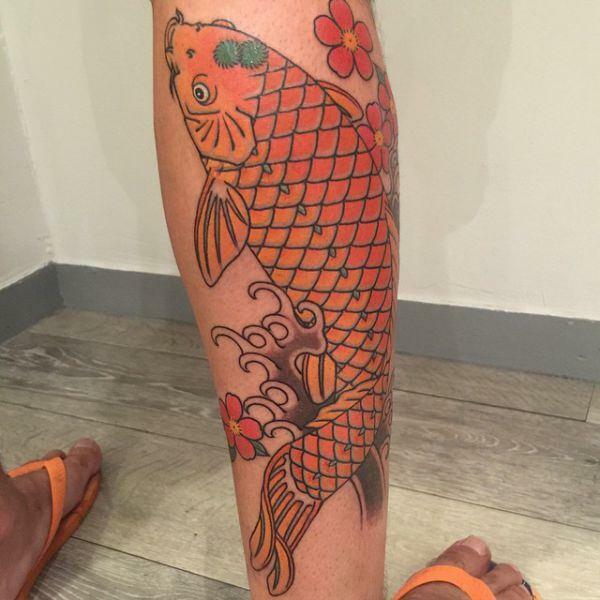 In the Japanese language, ‘koi’ means carp fish or carp. 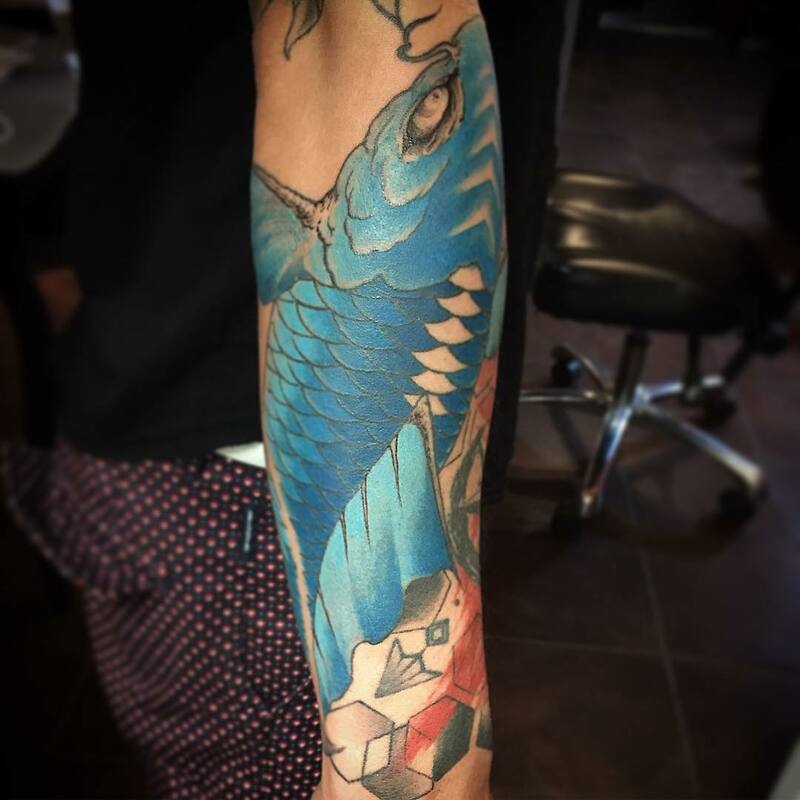 However, just because the word translates to something so simple doesn’t necessarily mean that it does not hold any symbolism. 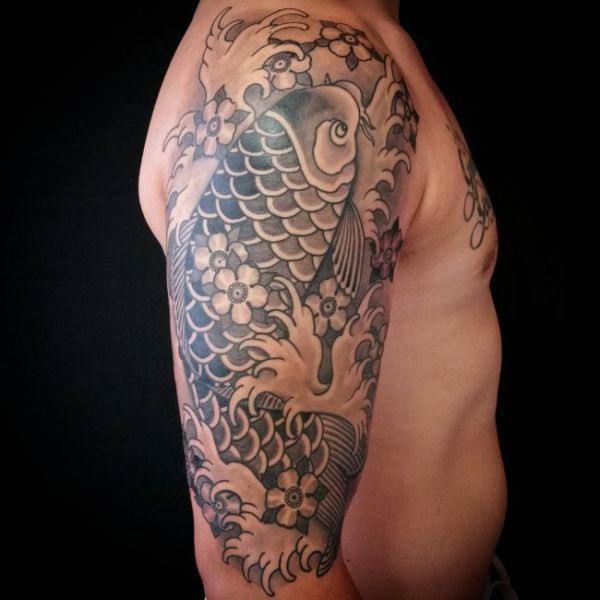 In fact, the word itself holds an important position in the Japanese culture and society. 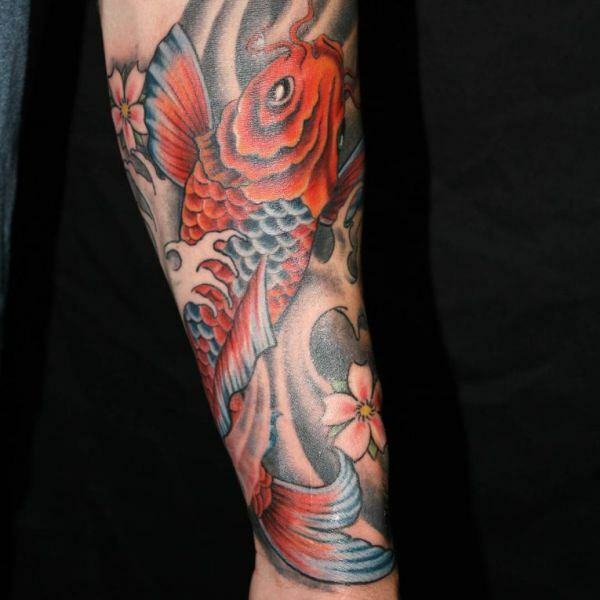 Koi is an extract from the Japanese word ‘nishigikoi,’ a fish that comes in a vast range of colors. 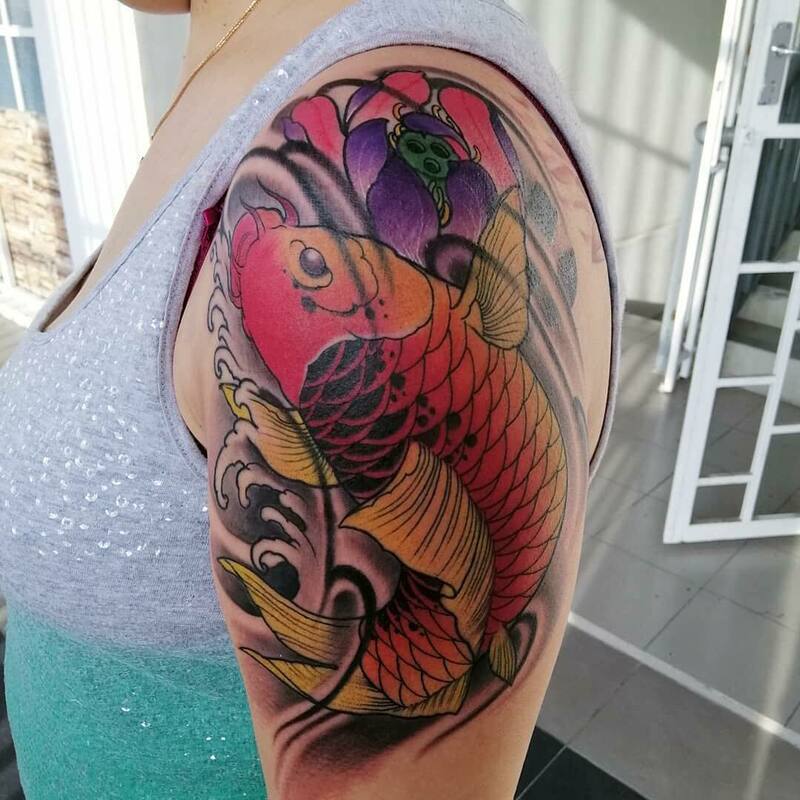 With its scales enhanced and maintained with beautiful patterns, many people keep koi fish as pets and raise them in ponds. 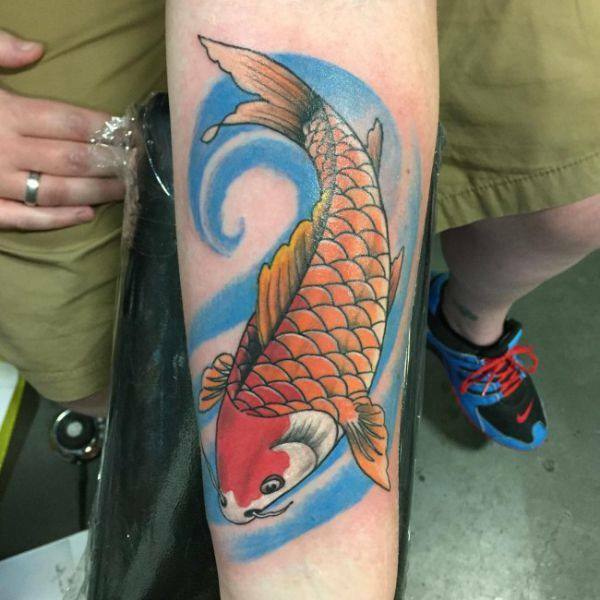 You can find different types of pet stores all around the world selling just koi fish. 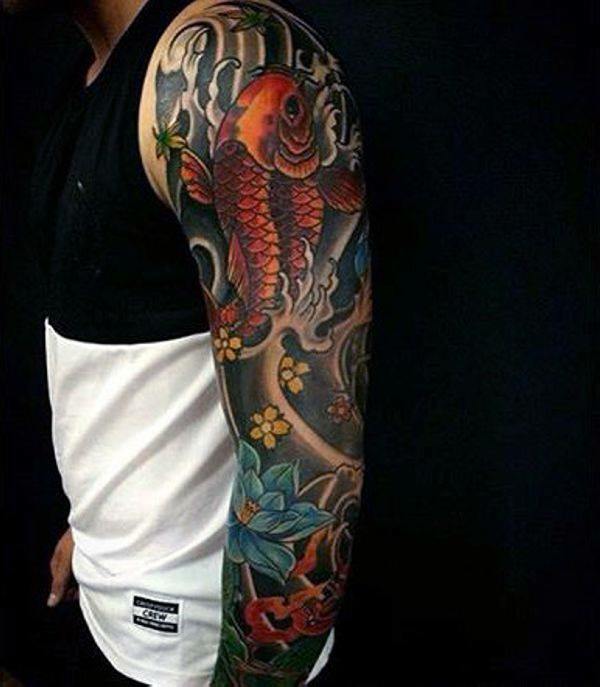 The reason for that is because koi is hugely popular in the world because of its diversity, patterns, and color. 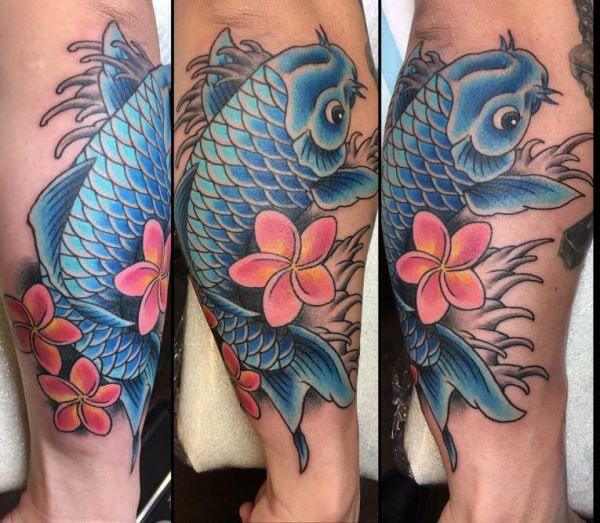 It’s an expensive fish with a high-maintenance. 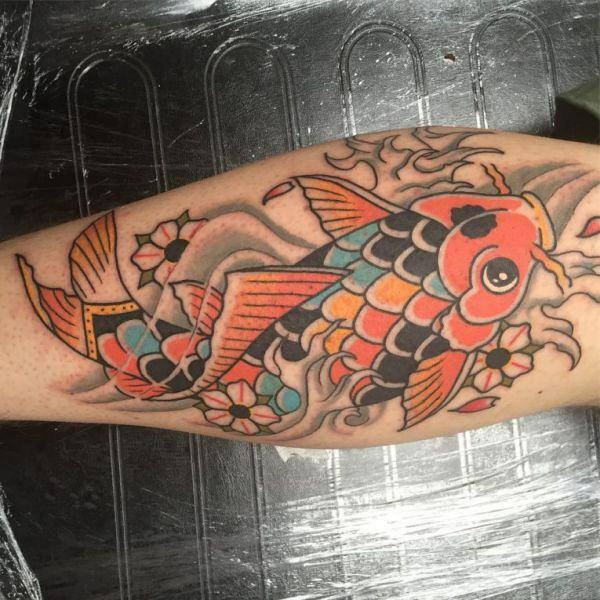 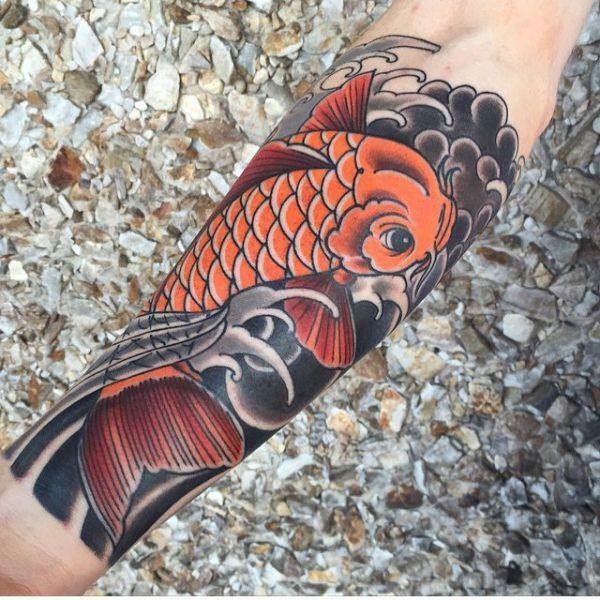 Koi fishes are not just popular as pets but also as a common subject in tattoos. 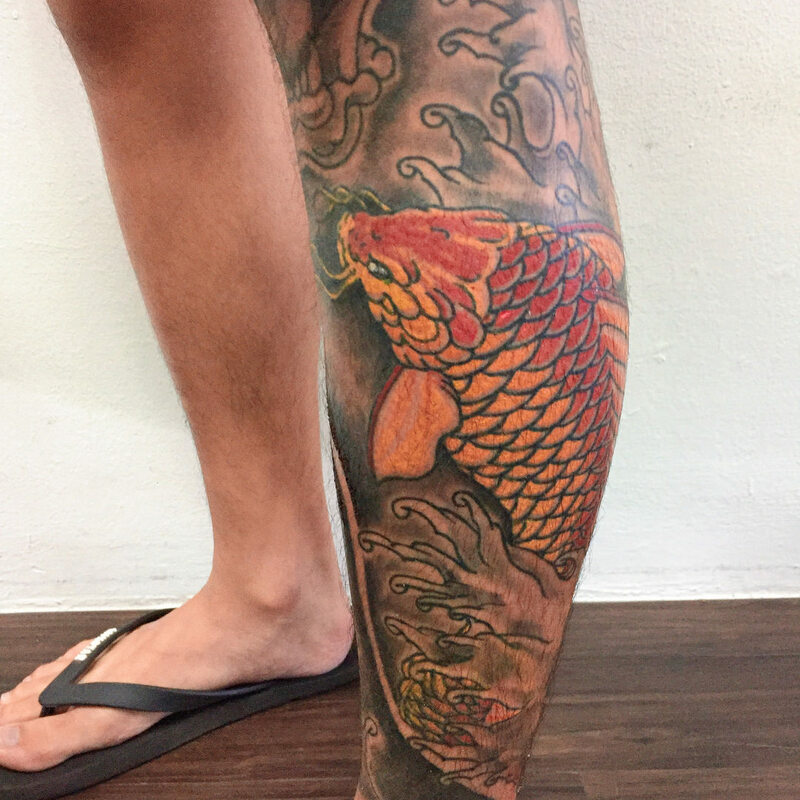 As per some of the tattoo designers, koi fish portray prosperity, good luck, power, resolution, persistence, and so much more. 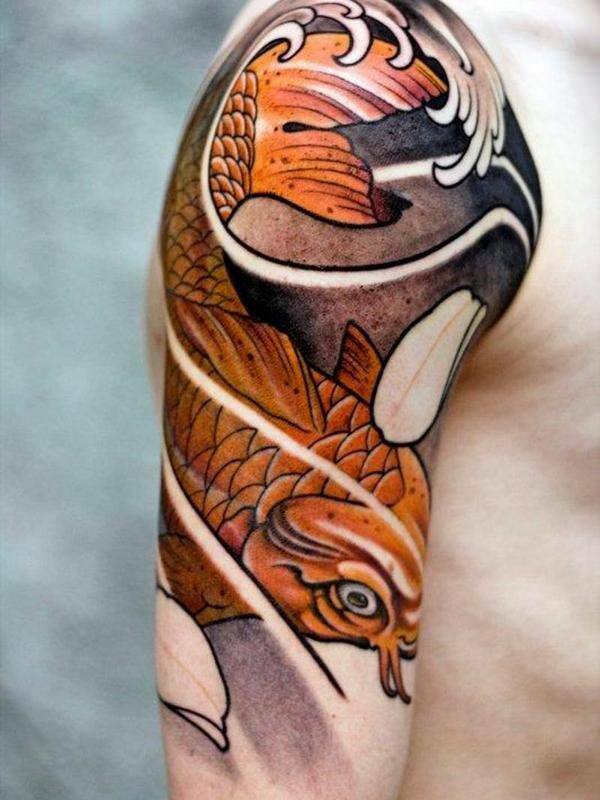 All of these elements constitute to the fact that people of Japan and China hold an enormous amount of respect and admiration for koi fish. 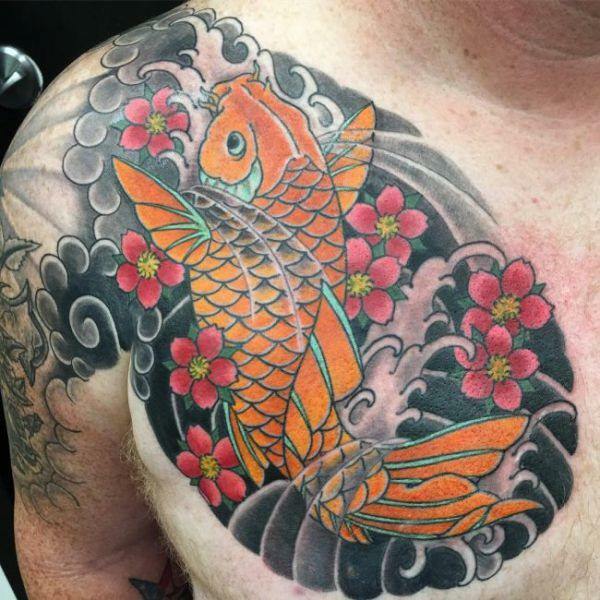 Without a doubt, when it comes to tattoo design, koi fish are one of the most popular choices that people select for the tattoo design. 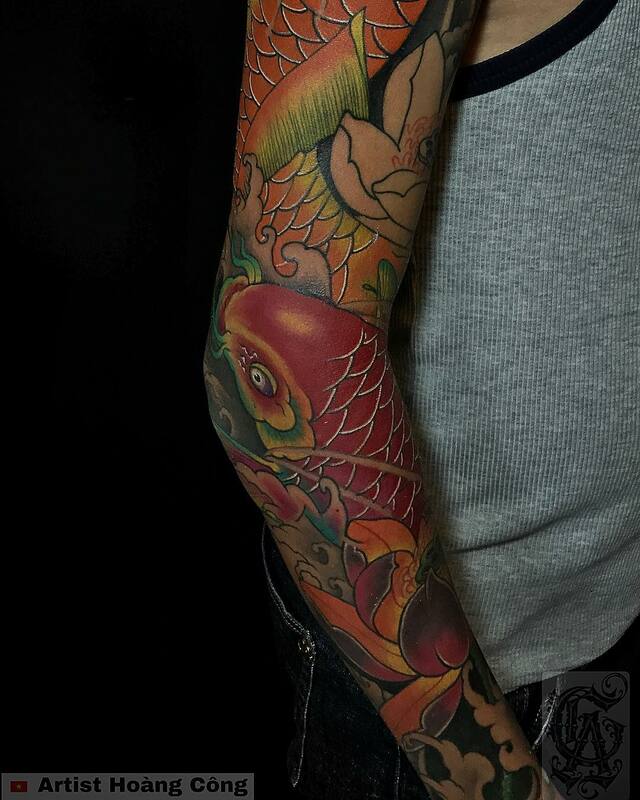 They are attractive and colorful and captivate the attention of many people. 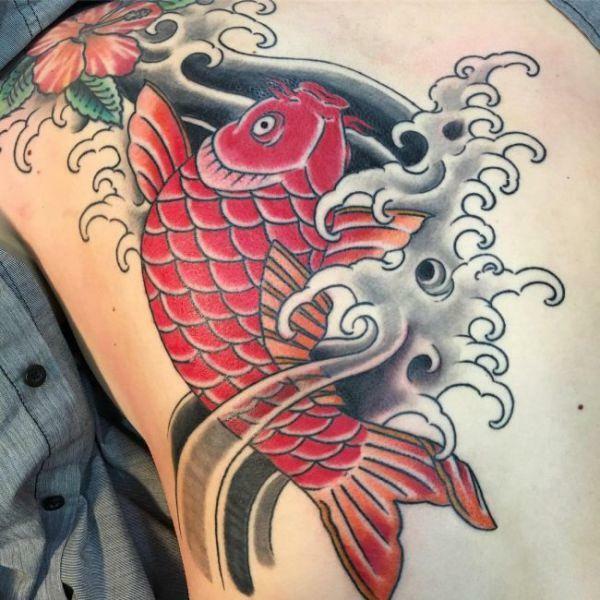 Koi tattoos are popular among both men and women. 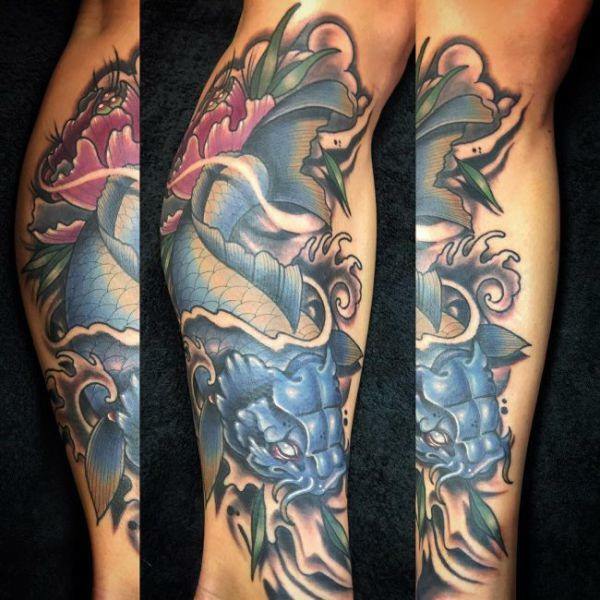 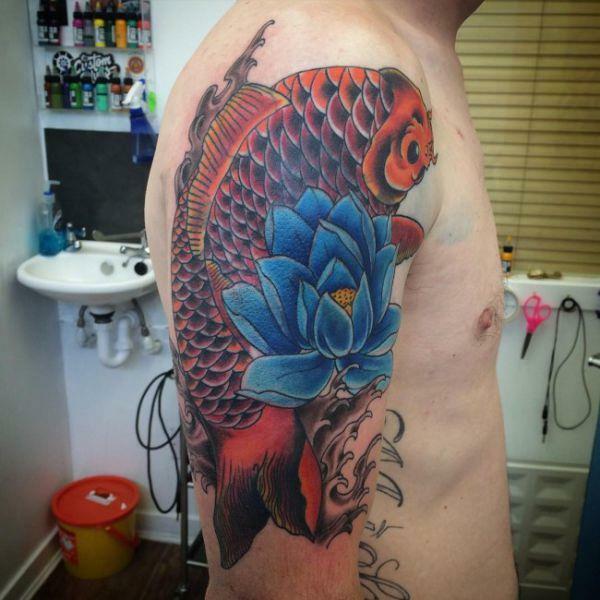 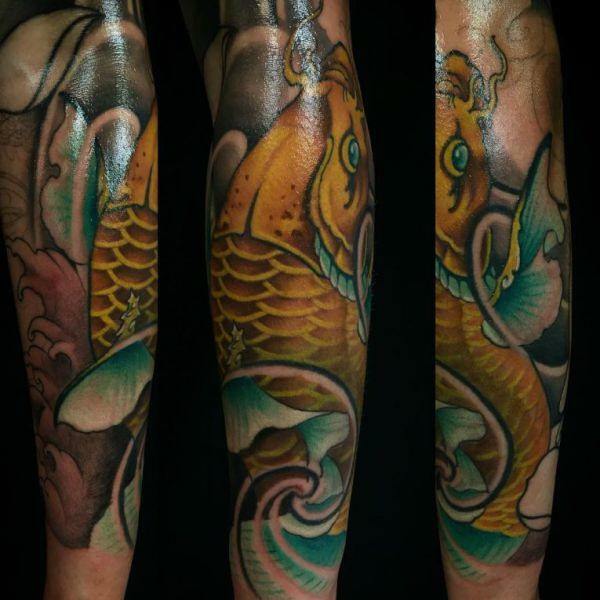 The reason why people select koi tattoo design is that the fish itself resonates more with the human nature. 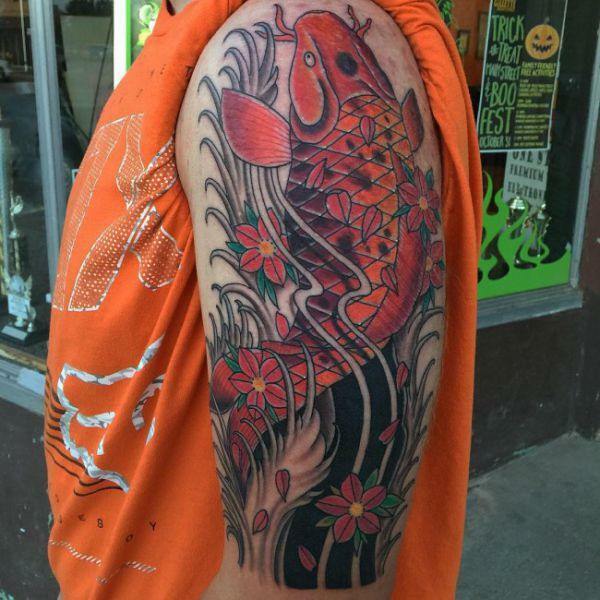 Koi fishes are beautiful, energetic, and compassionate particularly when they are in their natural habitat. 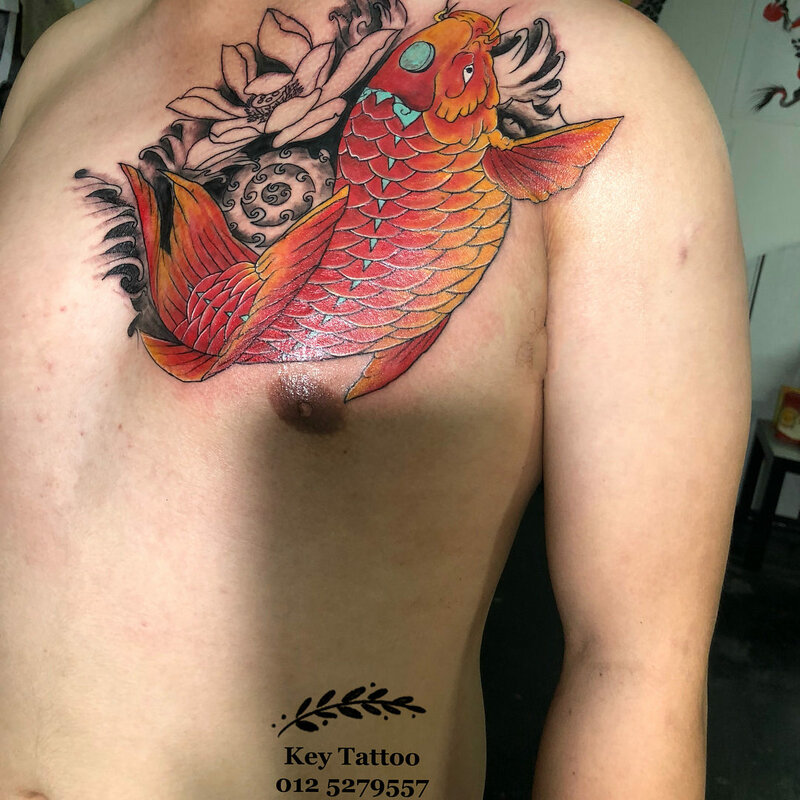 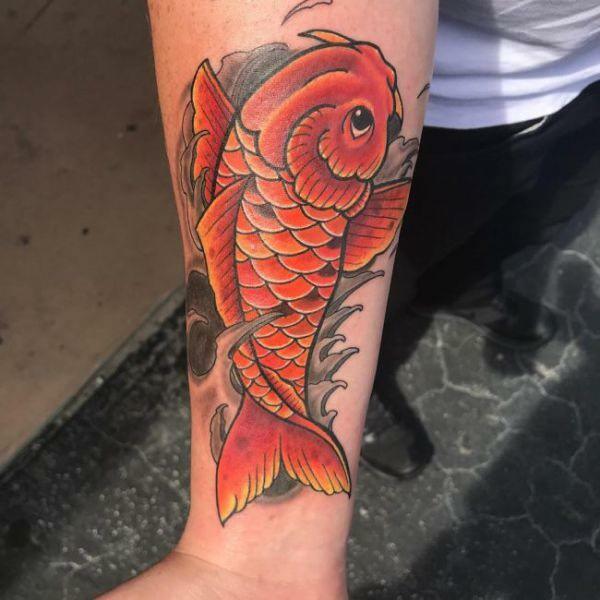 One more significant reason why people choose koi tattoos is that the fish has a comprehensive range of meaning and symbolism in each of its design. 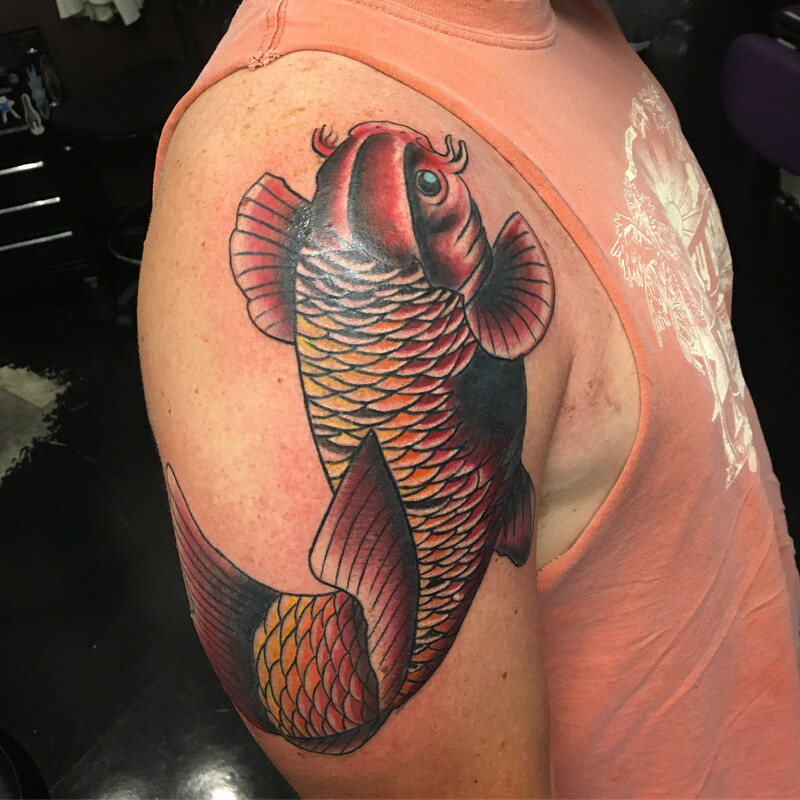 In Chinese culture, koi fish holds a vast amount of respect in society, and the symbolism and meaning behind this fish dates far back. 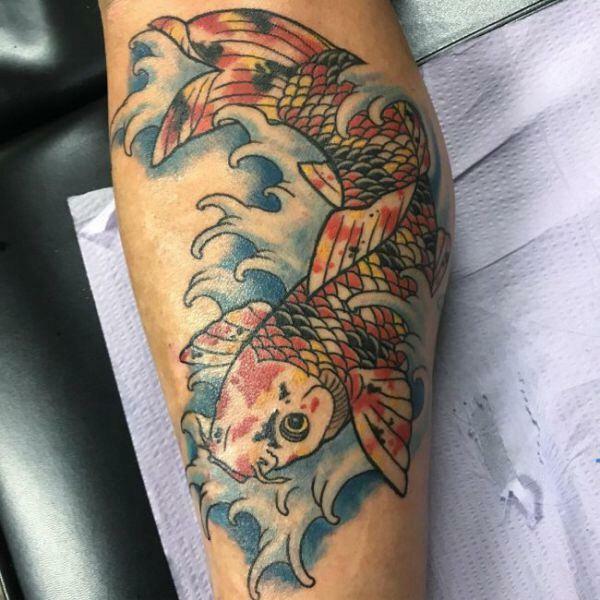 As per the Japanese and Chinese mythology, in ancient times, a lot of people witnessed thousands of koi fishes swimming all the way to the Yellow River in China. 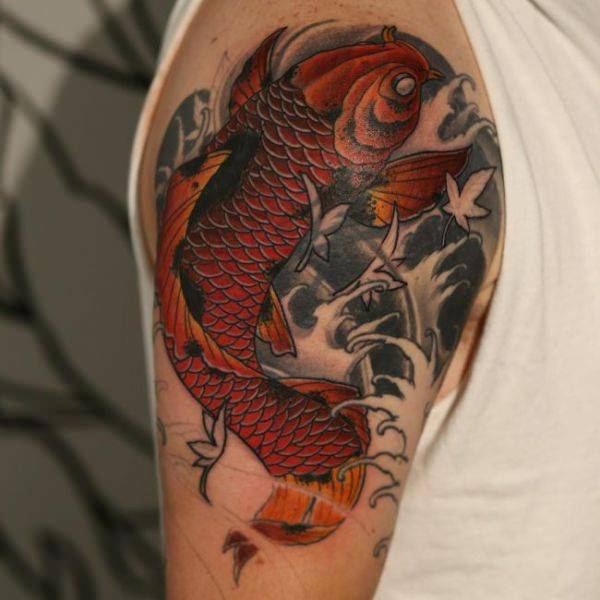 Koi fish are known to be the most active fish that swims against the flow. 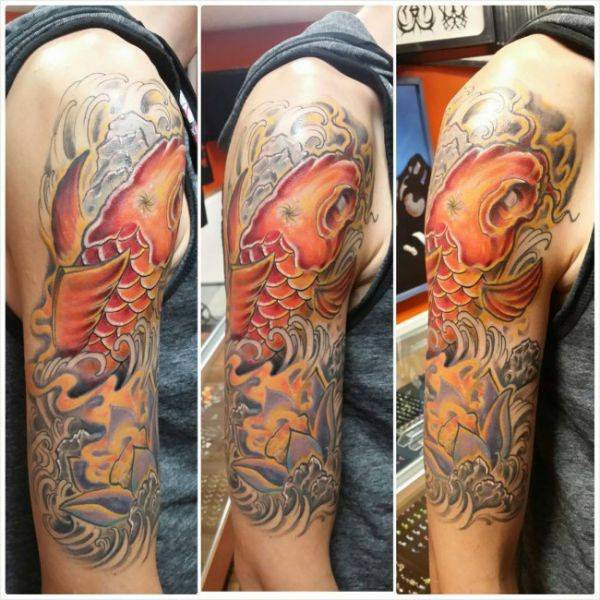 Legend has it; the Gods rewarded koi and transformed it into a beautiful dragon. 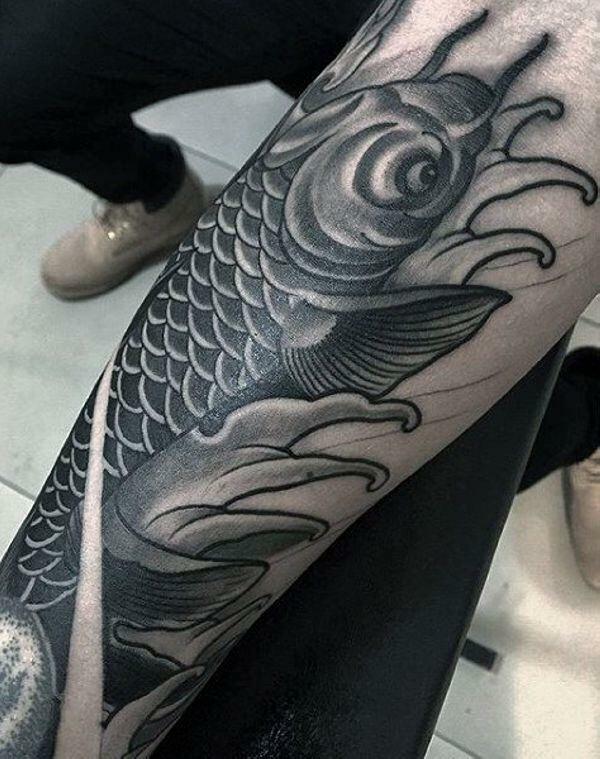 Some myths also suggest that if the fish gets caught, it will wait for its cut with pride and courage similar to a samurai warrior without any shiver. 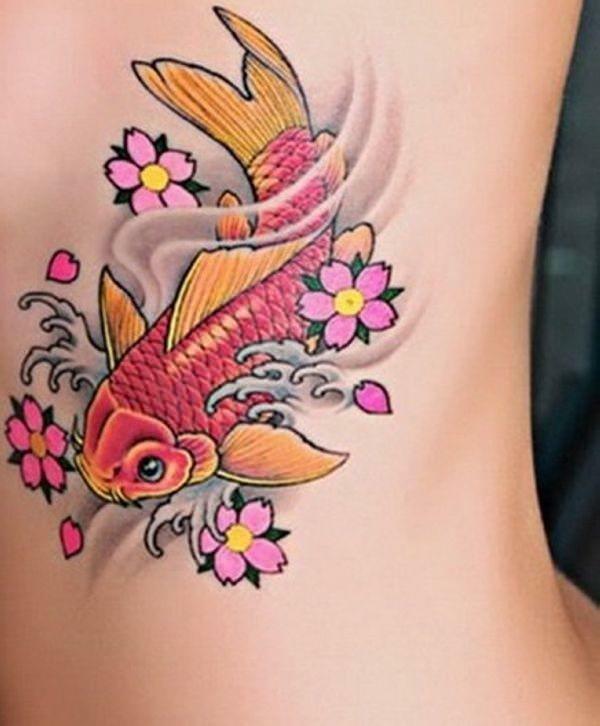 Also, the symbolism is mostly dependent on the shape, size, and color of the tattoo. 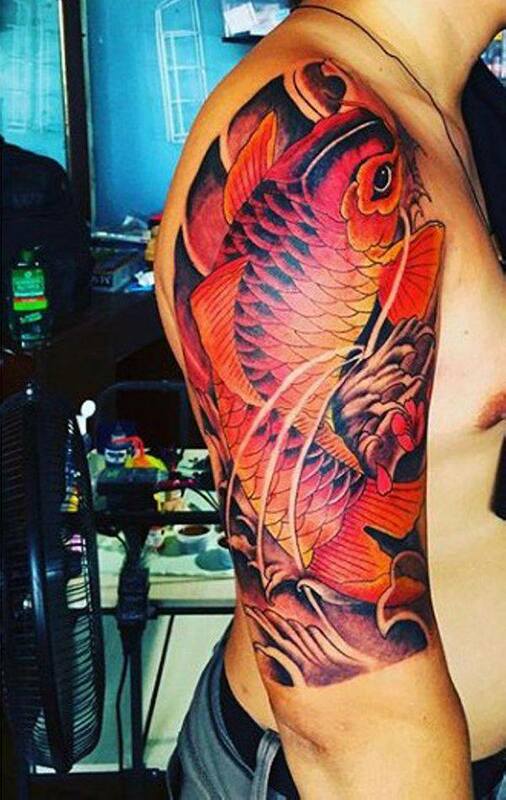 If the tattoo is going up, it defines something different than the tattoo going down. 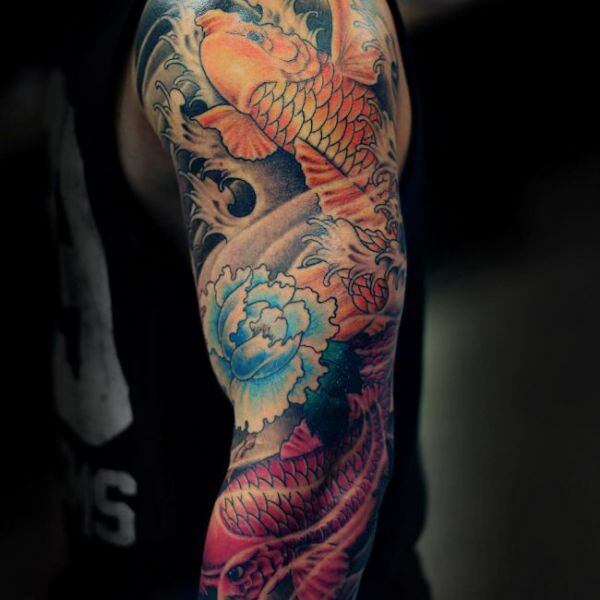 You are not powerful enough to overcome your hurdles and reach to the path of success. 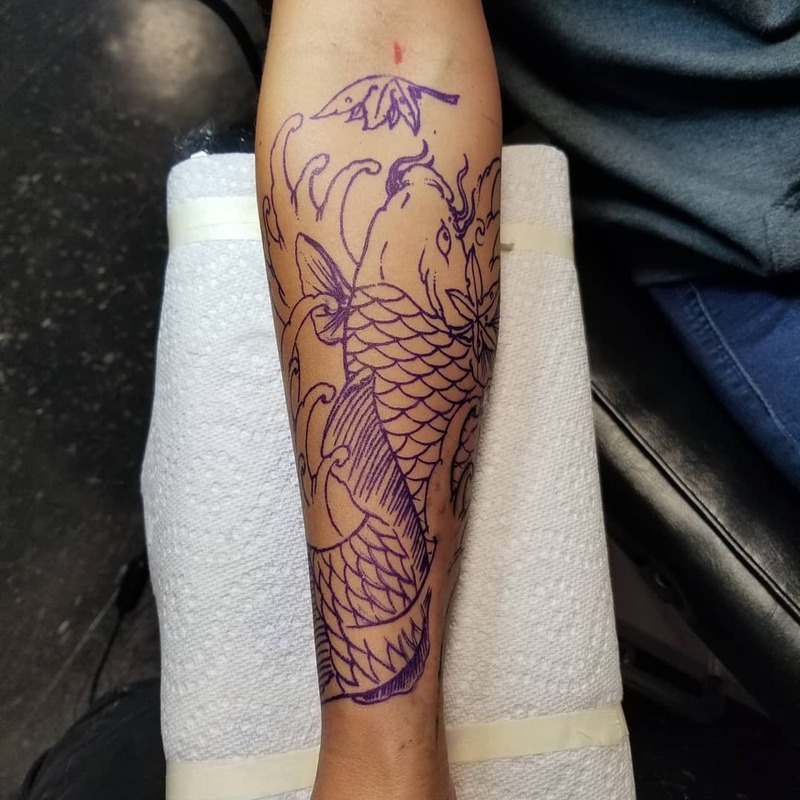 You need some time. 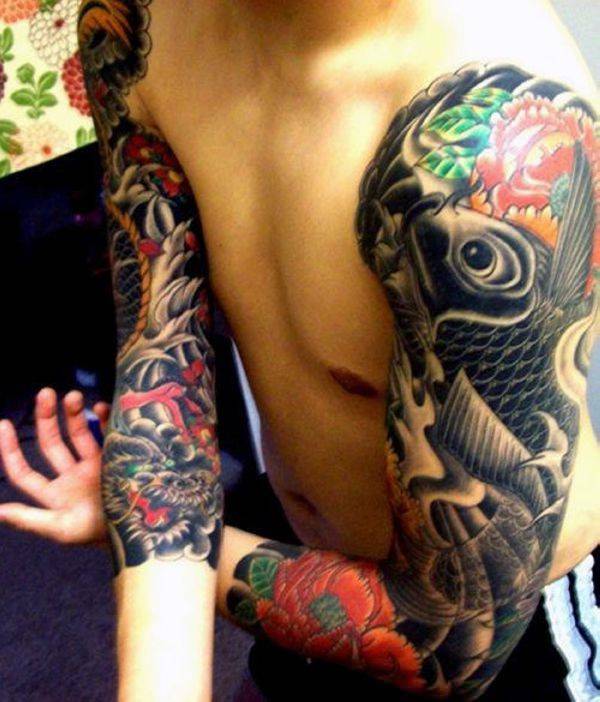 You have already fulfilled your goals and dealt with your hurdles. 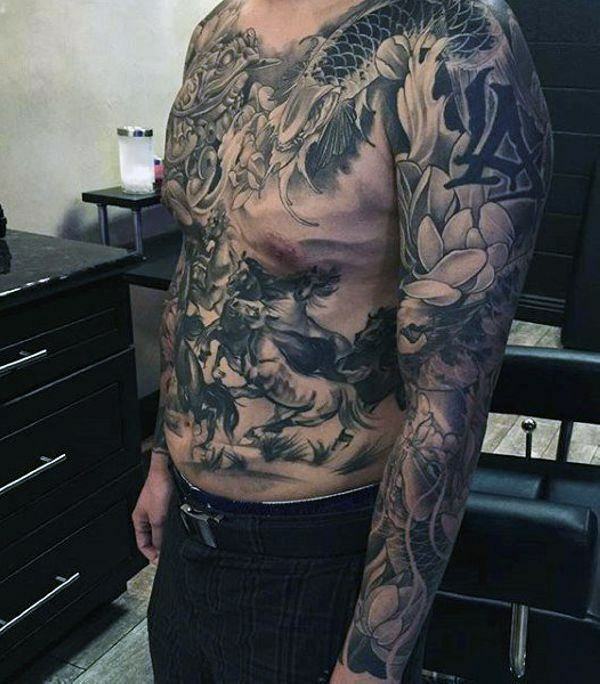 You are in no position to fight the underlying problems. 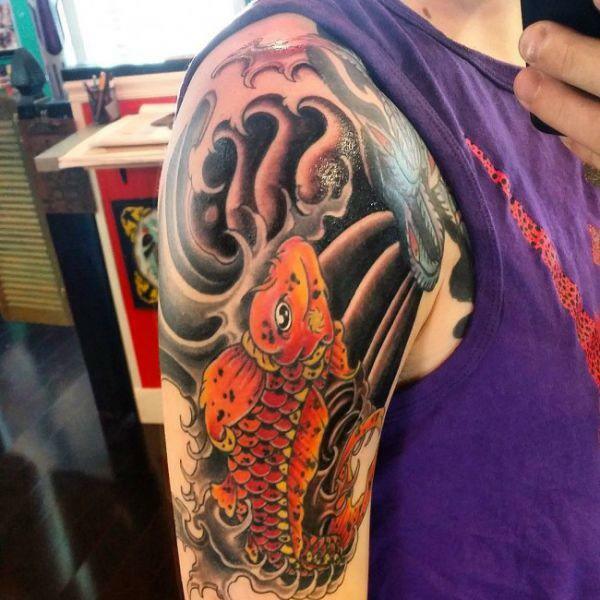 You are currently experiencing some difficulties in life and constantly fighting to survive without giving up. 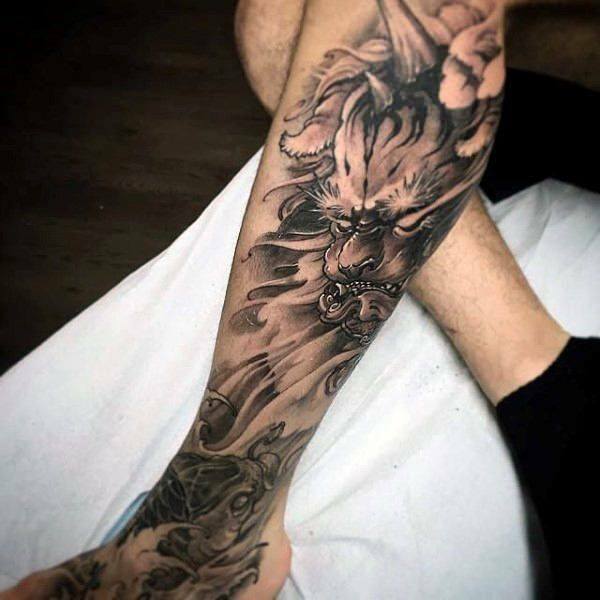 You have overcome all of your hurdles and have now gathered enough power and will to continue the fight by not giving up. 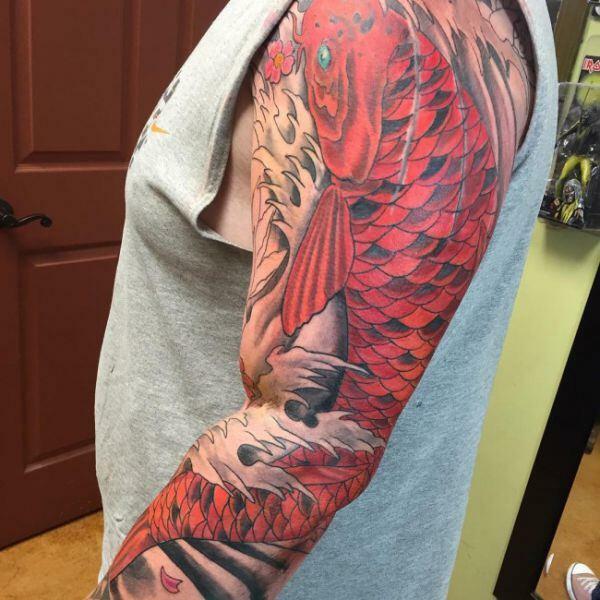 Pink and red colored koi fishes are a symbol of affection, love, and desire. 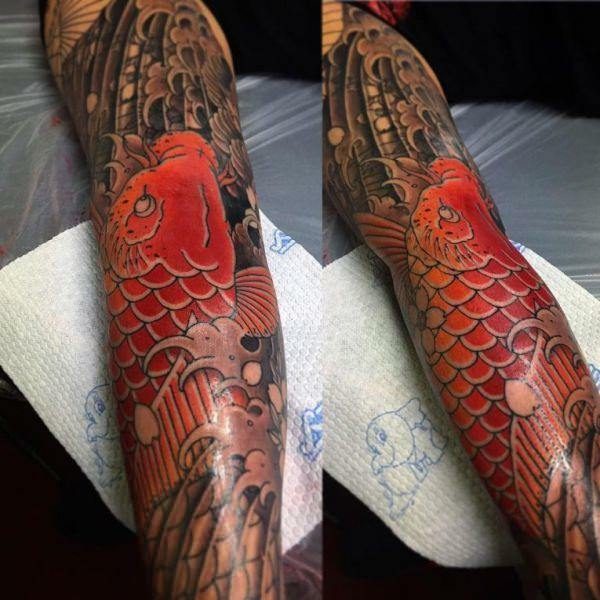 Simply red-colored koi can also be classified as a sign of strength and bravery. 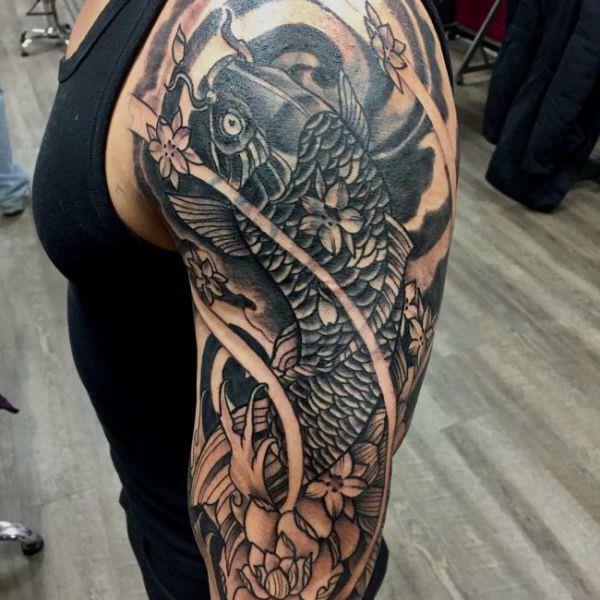 A black koi fish represents overcoming a hurdle, like a drug addiction, abusive relationship, substance abuse, depression, etc. 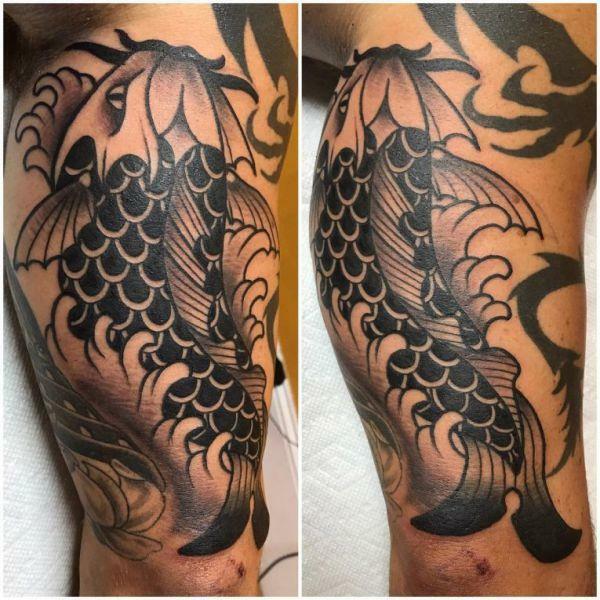 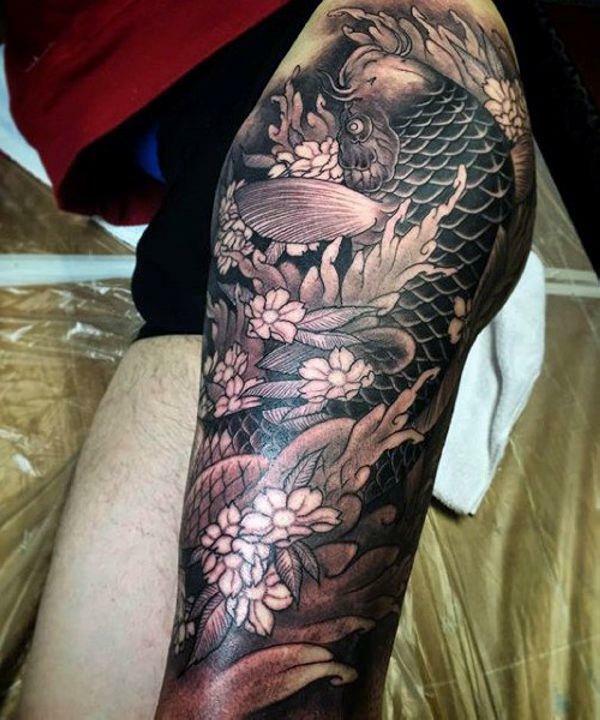 A black koi fish is a perfect representation of people struggling to get better; people that have overcome their hurdles and reached the place for strength. 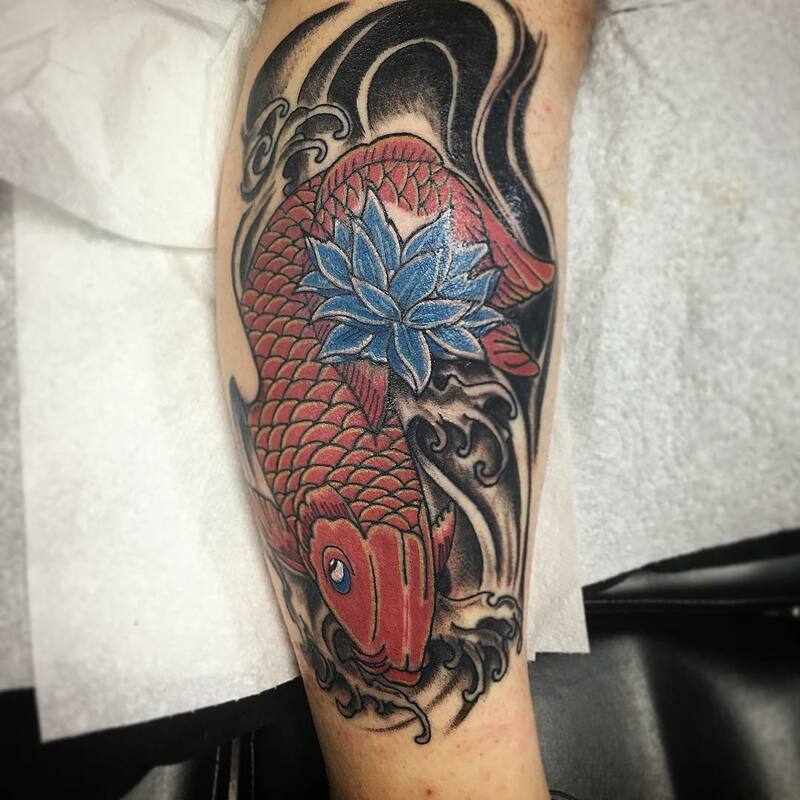 A white koi fish with a red mark on the head represents wealth and success. 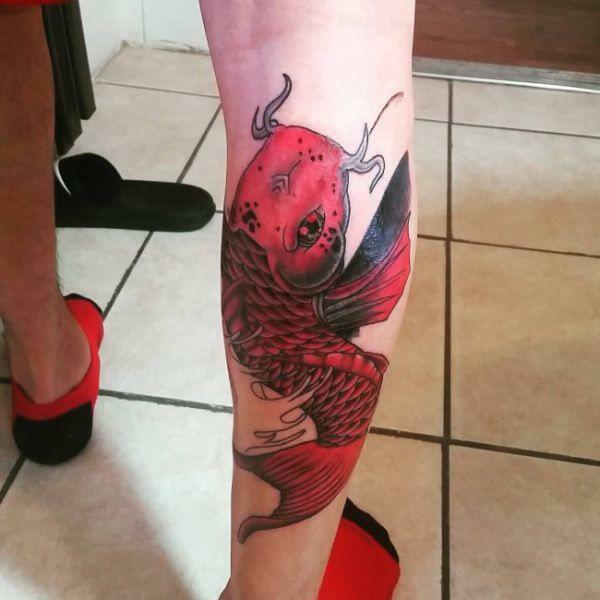 A white koi with different red markings near mouth similar to the lipstick represents love, affection, and happiness. 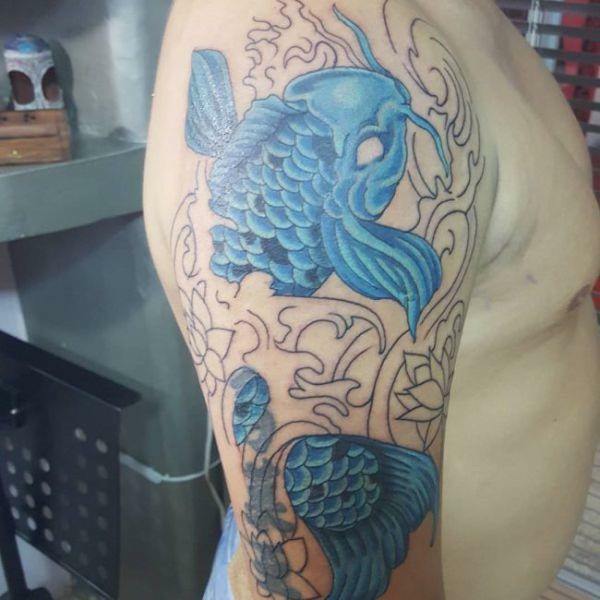 A blue koi fish is a symbol for men and describes the symbol for reproduction. 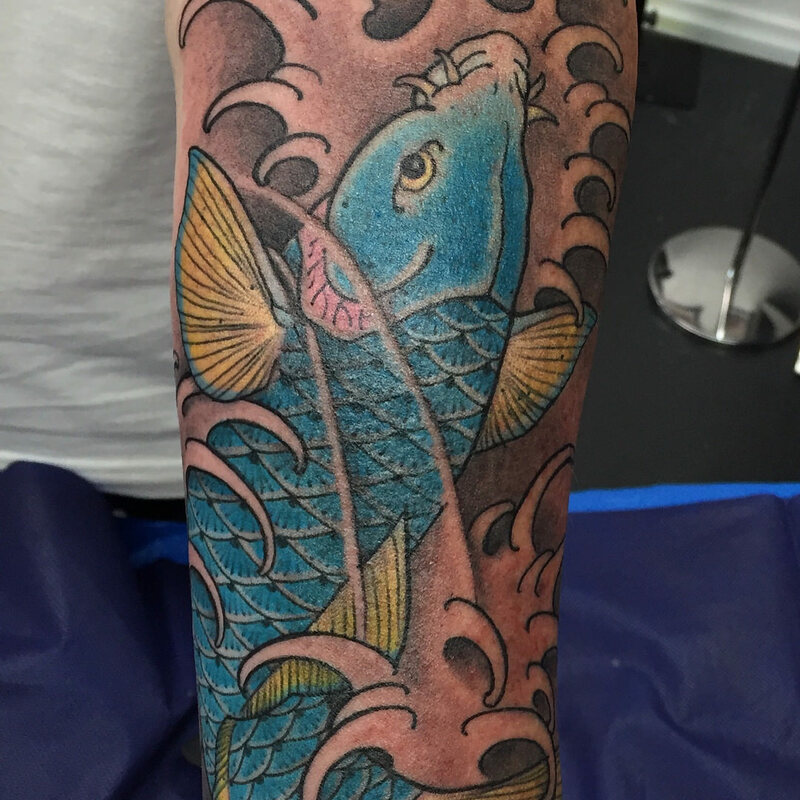 Besides reproduction, a blue koi fish also highlights calmness, peace, and tranquility. 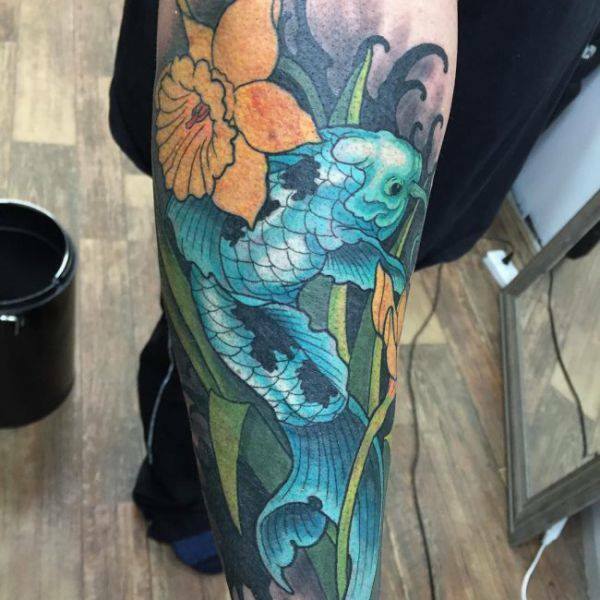 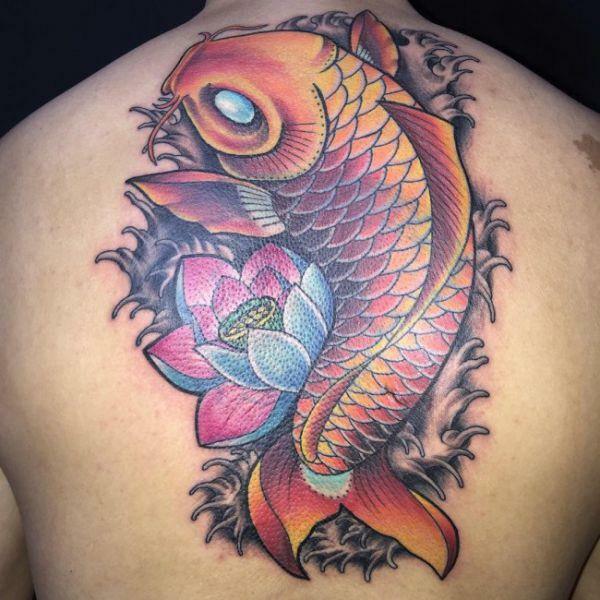 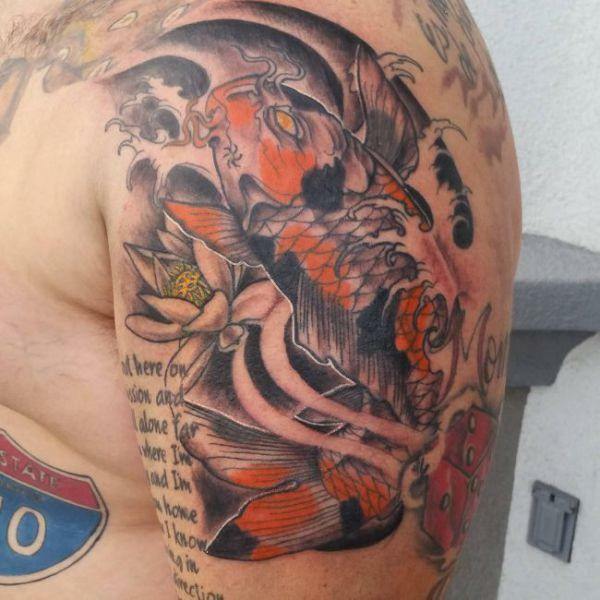 This multi-colored type of koi fish is all about treasure, prosperity, and unlimited wealth. 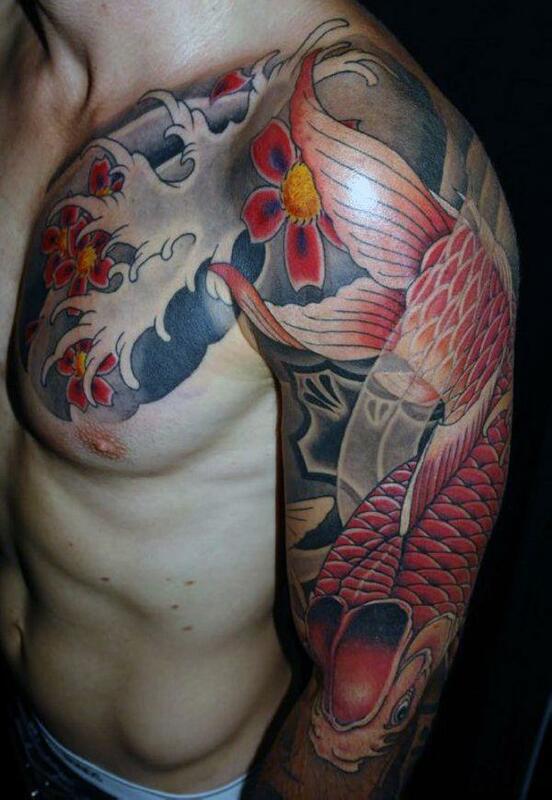 A koi fish tattoo today also integrates with lotus flowers. 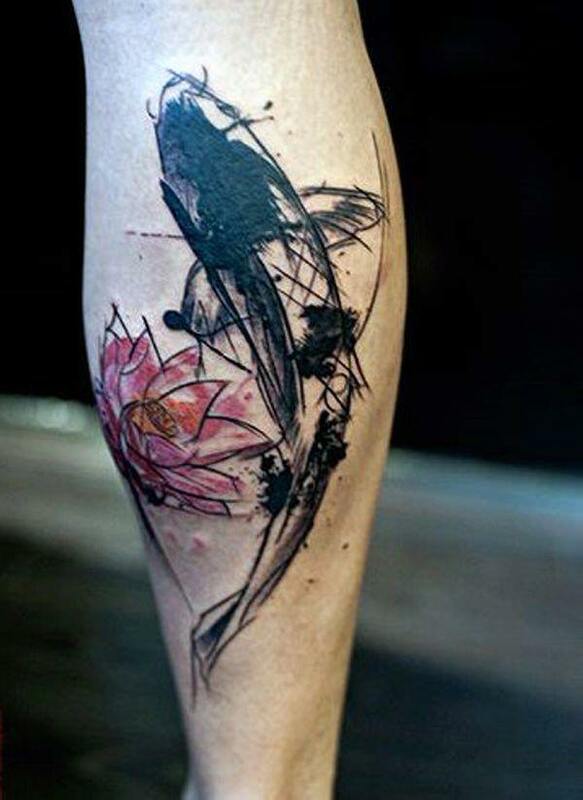 A lotus flower is a famous flower that grows on the muddy ponds. 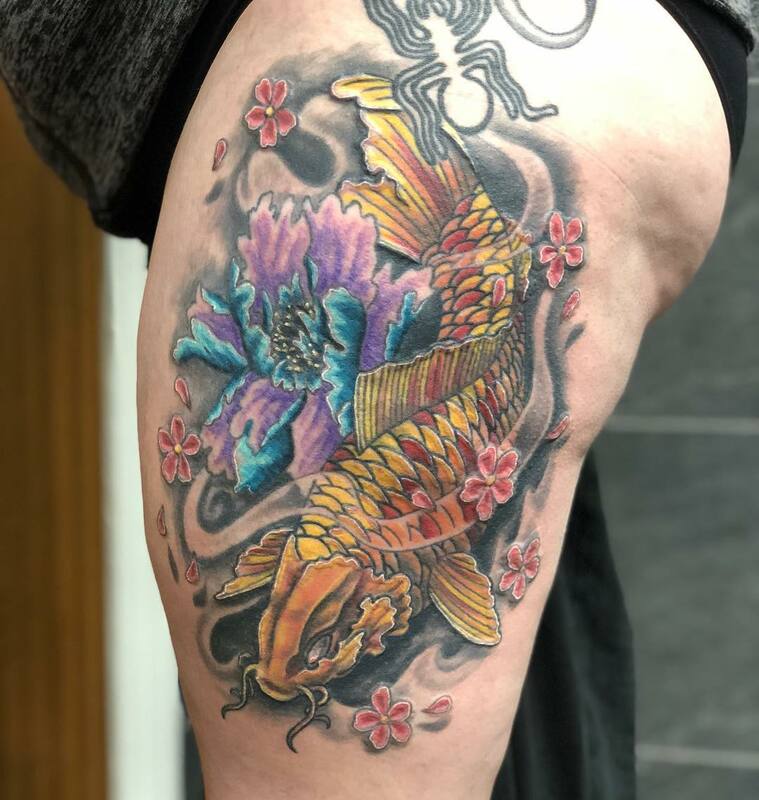 Similar in nature to the koi fish that started as a small fish transformed into a giant dragon, the lotus flower is grown on the muddy pond but continues to look beautiful. 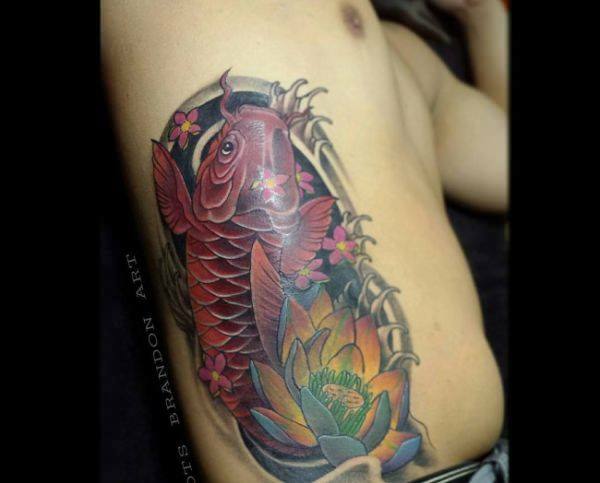 Amalgamating both koi and lotus together in a tattoo highlights the significance that people fail to miss. 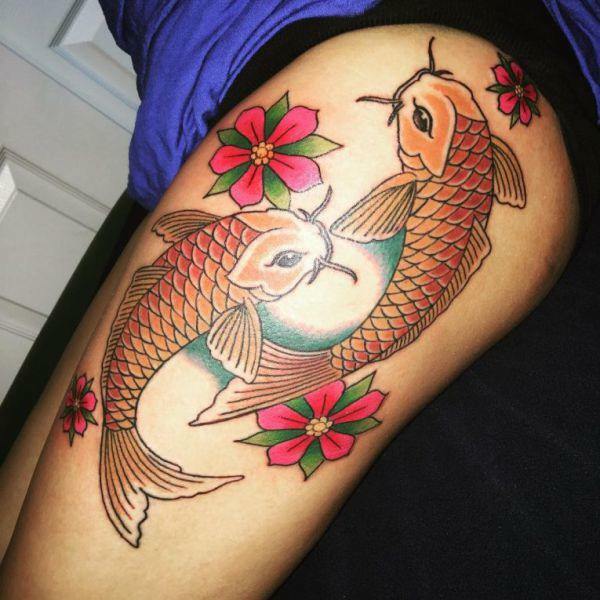 Koi and lotus when crafted together in a tattoo further talk about the struggle, pain, and growth. 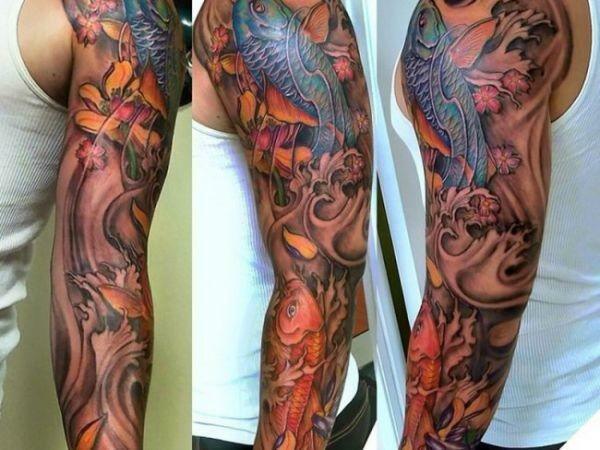 Most of the people when going for koi tattoos get it done in their upper arms similar to a sleeve style. 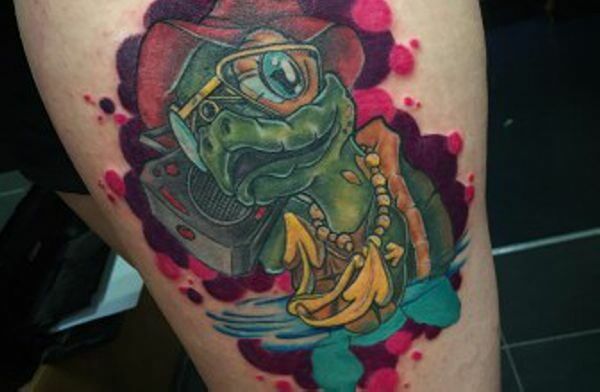 Other popular choices are back and leg tattoos. 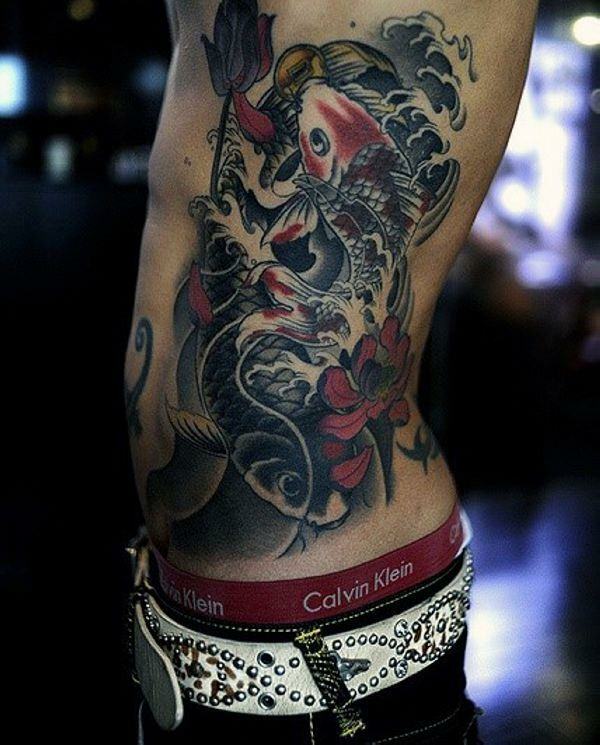 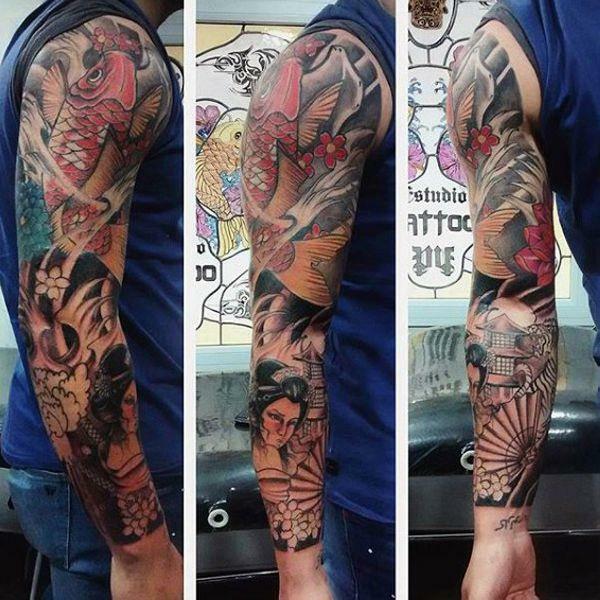 If you are planning to get a tattoo, research about various kinds of tattoo parlors in your area. 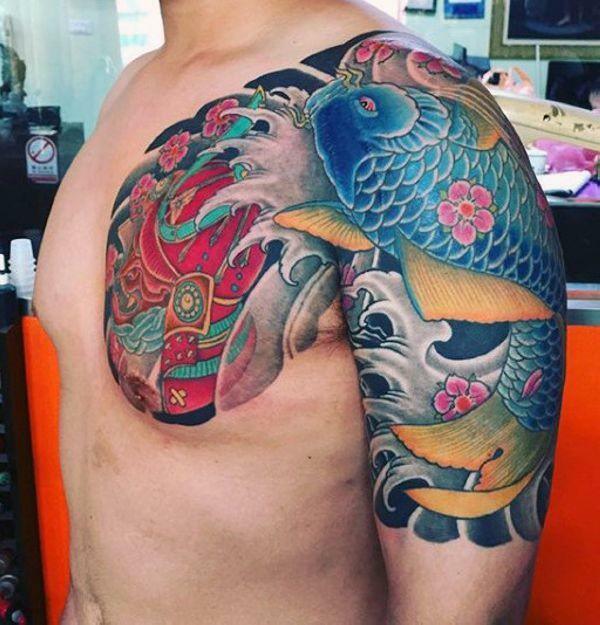 If you have friends who have tattoos and are satisfied with it, ask them to recommend you a tattoo parlor with a good reputation. 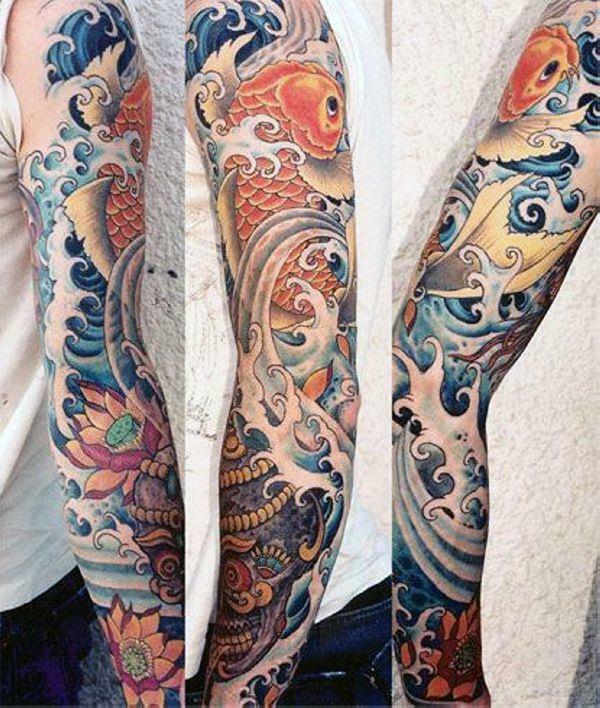 If you are taking inspiration about any particular design, make sure you brainstorm your ideas on a piece of paper. 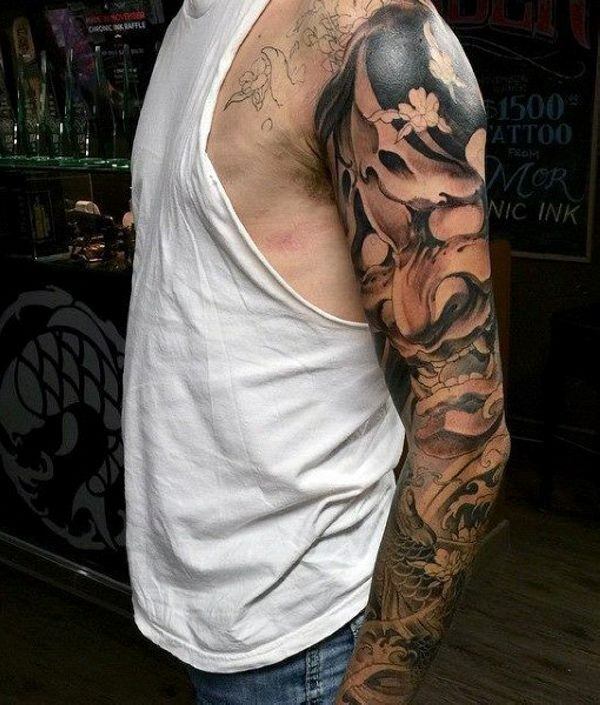 Create a sketch and hand it over to the tattoo artist for best results. 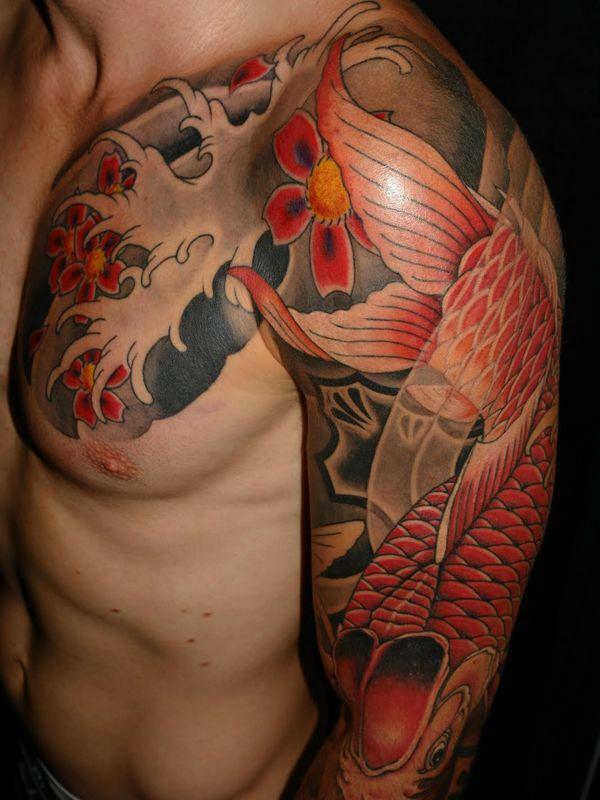 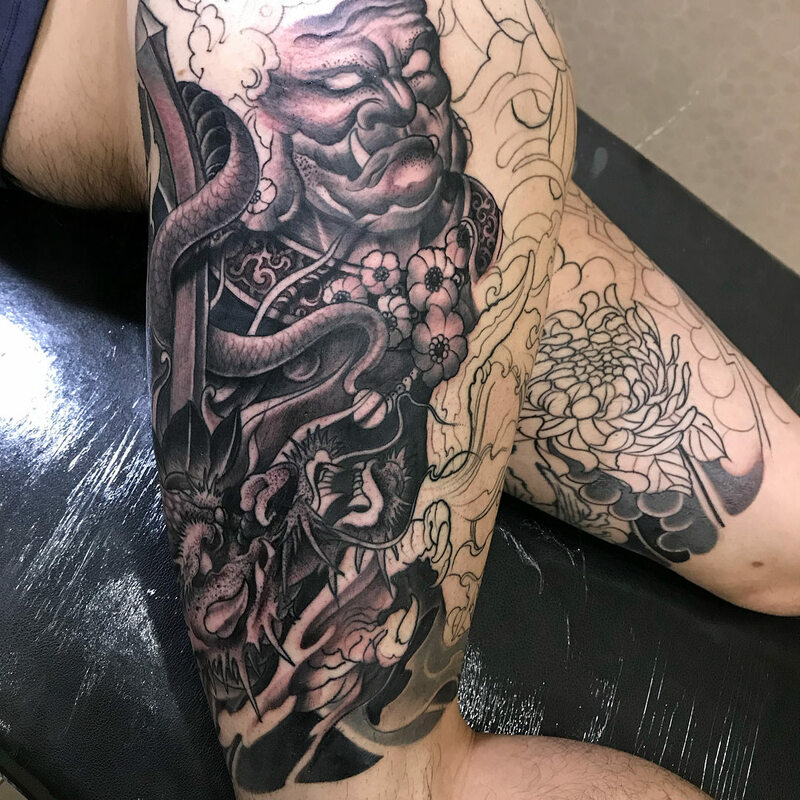 We all agree to the fact that koi fish and floral designs go hand in hand, and improve the overall design for the tattoo. 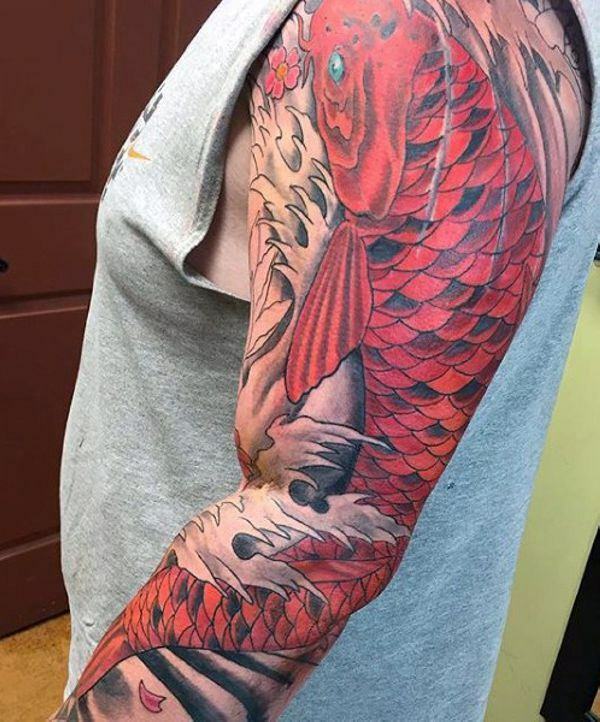 Since floral designs are in trend these days, fish combined with floral design transforms into a unique product that not only looks beautiful but visually appealing. 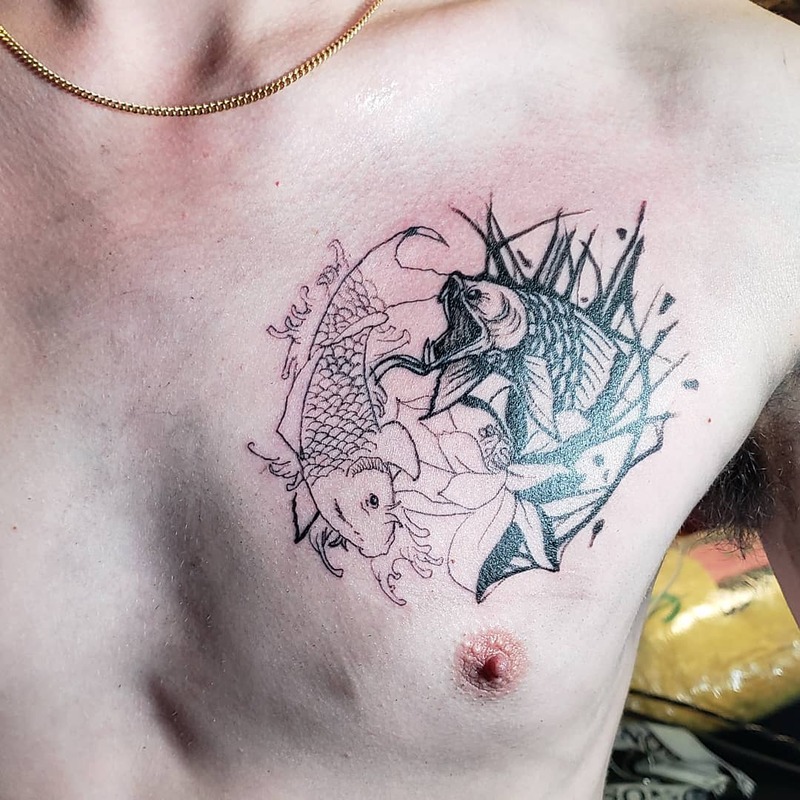 If you are planning to get a fish tattoo, start by sketching an idea you want on your body. 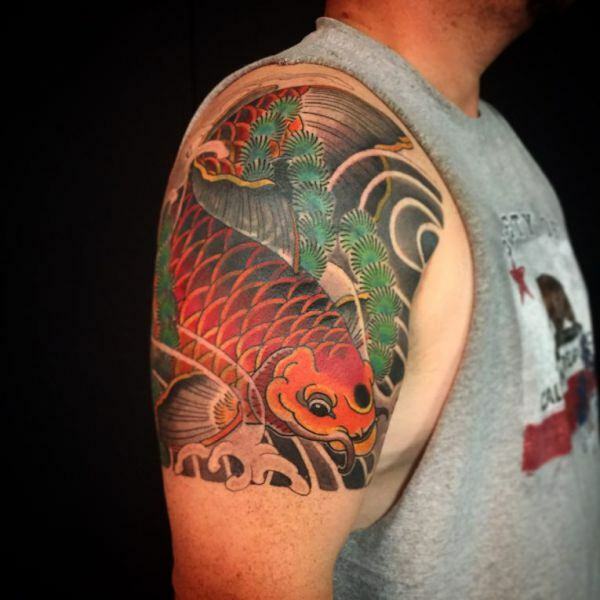 You can sketch a giant-sized fish with different colors to add depth and visibility. 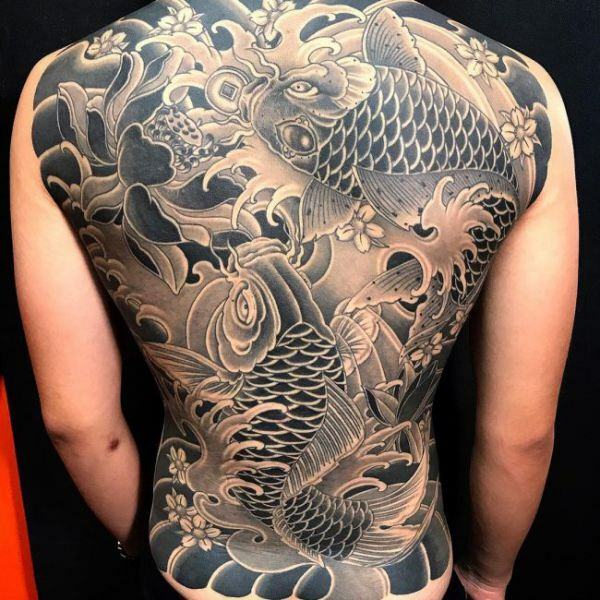 Once you complete the design, you can get it carved on your body. 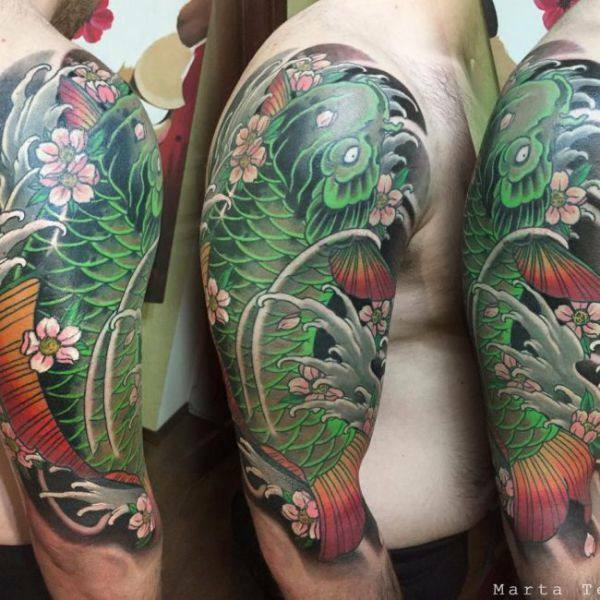 Designs like these turn out to be stunning and appealing to the human eye. 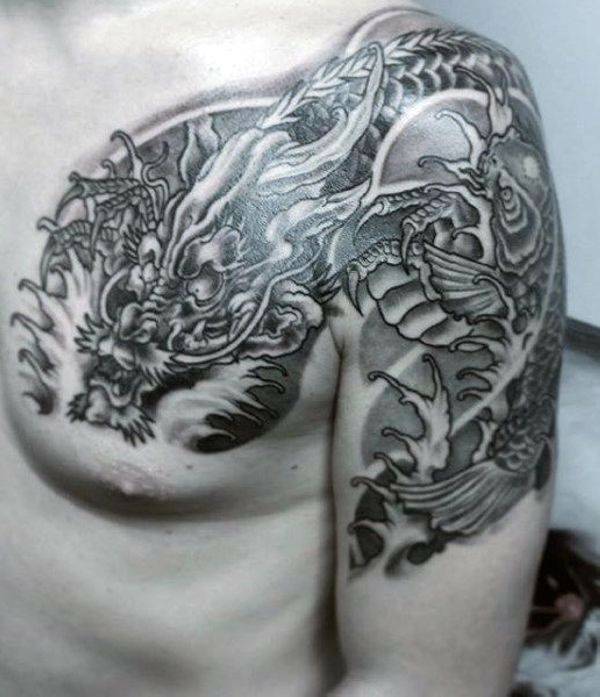 The Neck is another popular area where most of the people get their tattoo engraved. 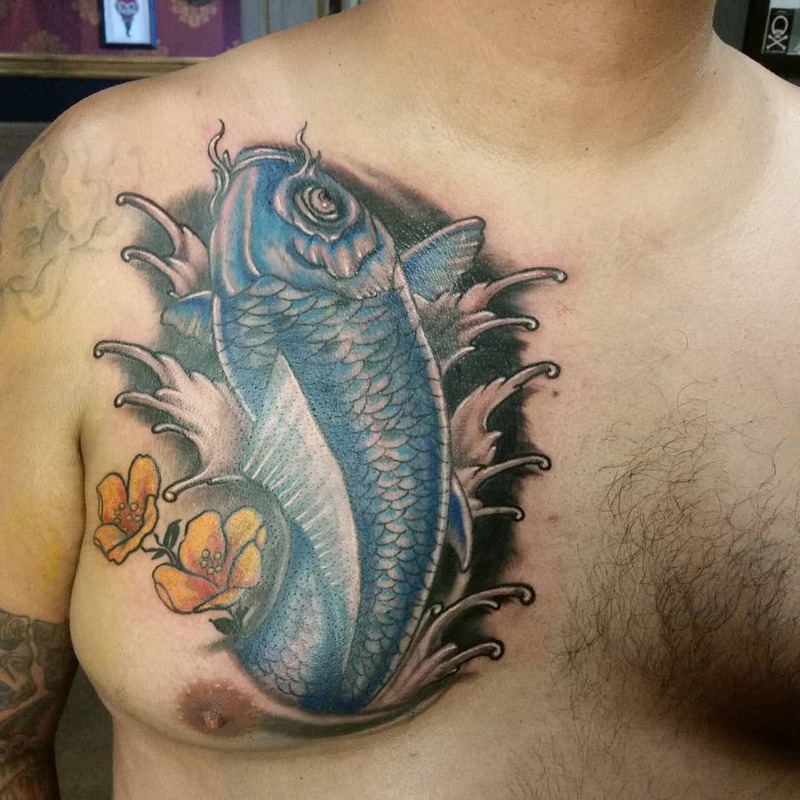 Neck flex tattoo is all about two different types of fish designed in the same direction with two different kinds of colors. 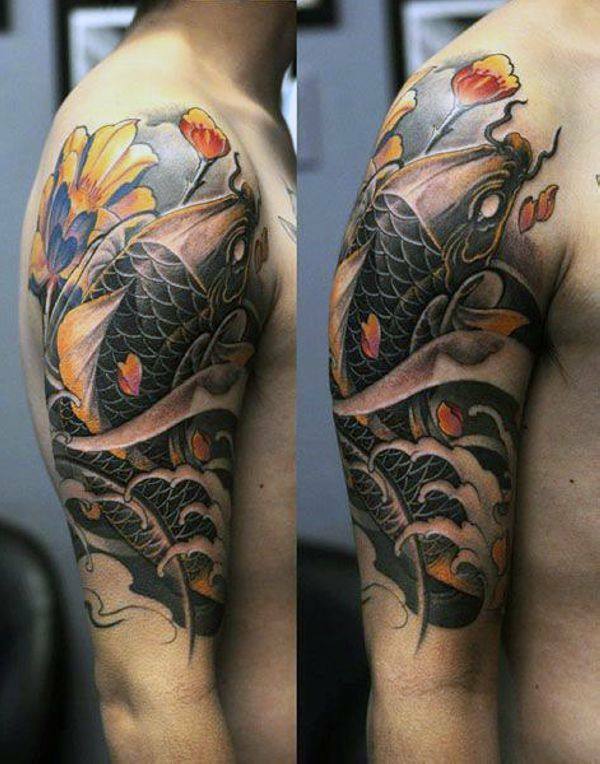 The design may seem a little simple but portrays intimacy and beauty. 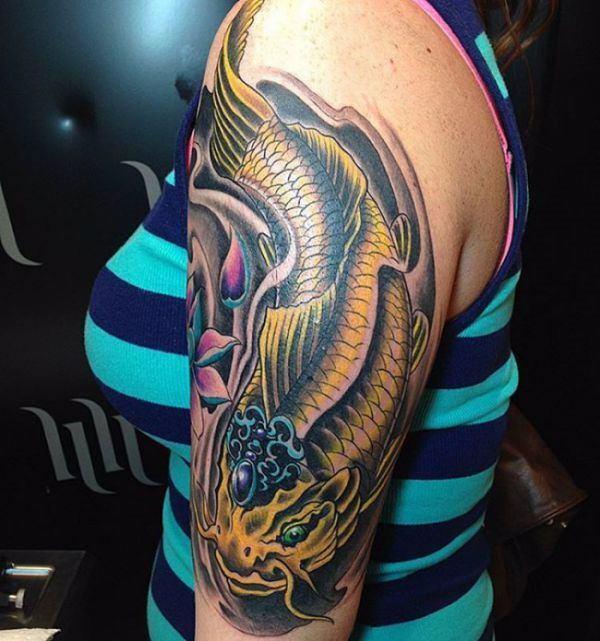 Mostly popular among females, this design can easily be engraved in other parts of the body. 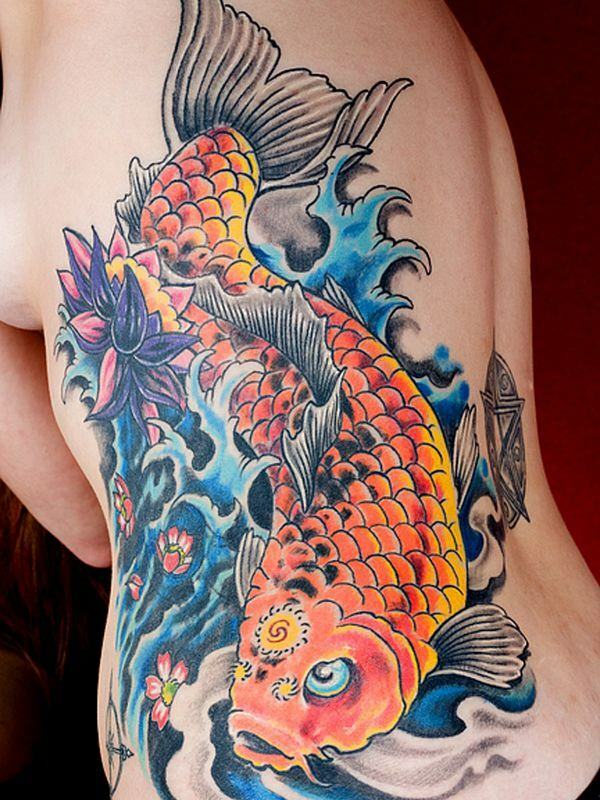 Swimming fish tattoos are the type of tattoos that are popular among young women. 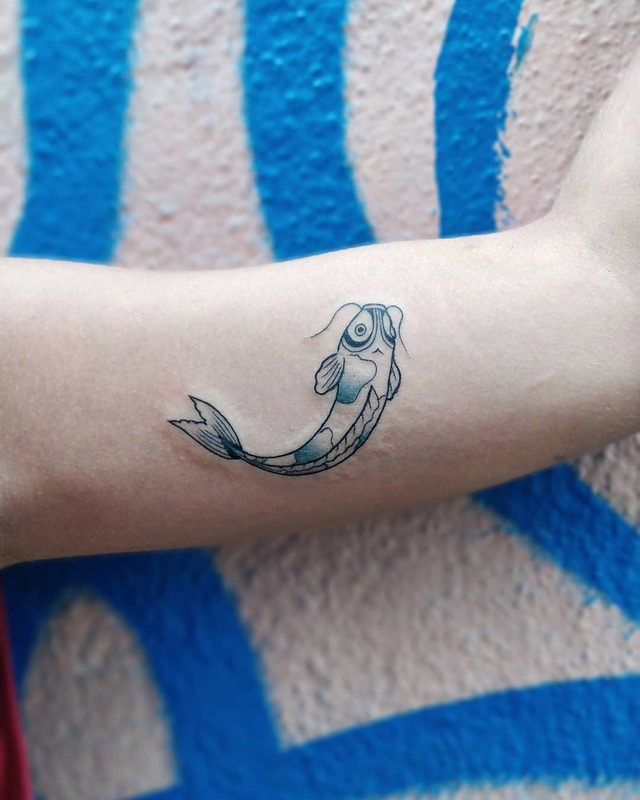 Young girls adore fishes swimming in a wave just like motion so much that they get this type of tattoo design in different parts of the body. 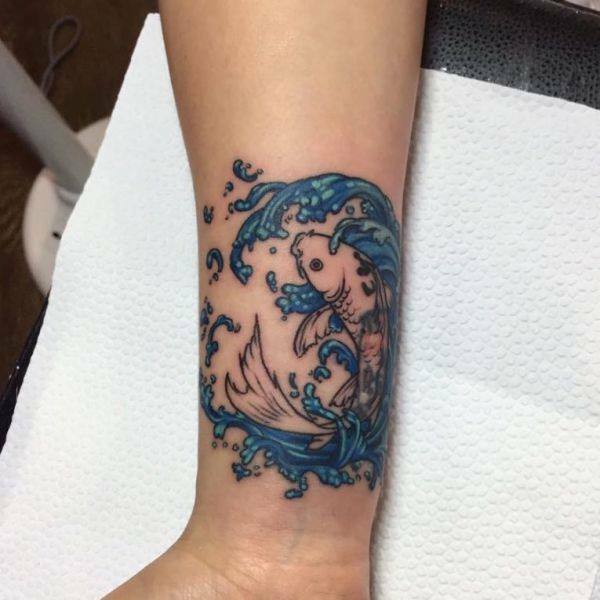 The idea for this design is relatively simple, a fish swimming in waves causing motion. 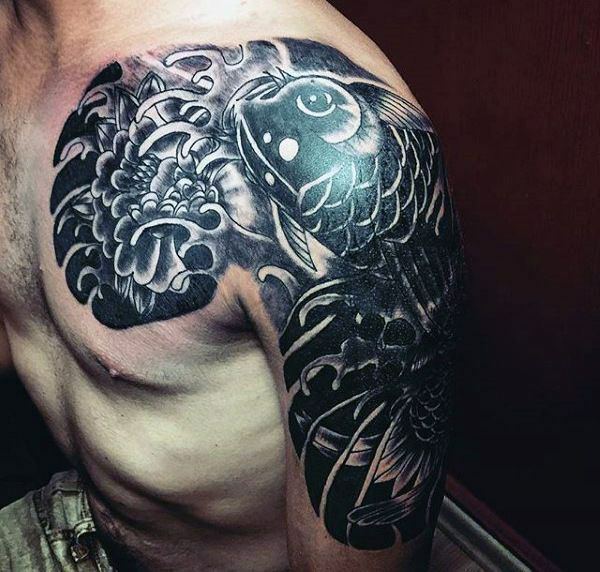 You can get this design sketched or crafted in different ways but mostly, people like keeping it simple. 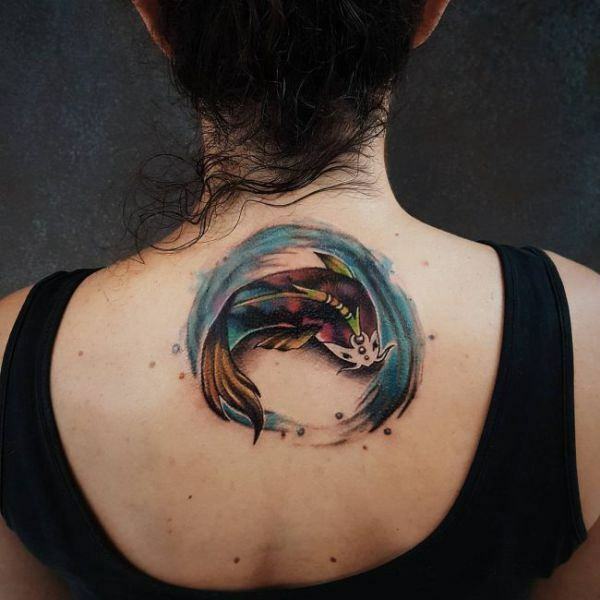 There is a big demand for this tattoo since it looks beautiful and appealing to the human eye. 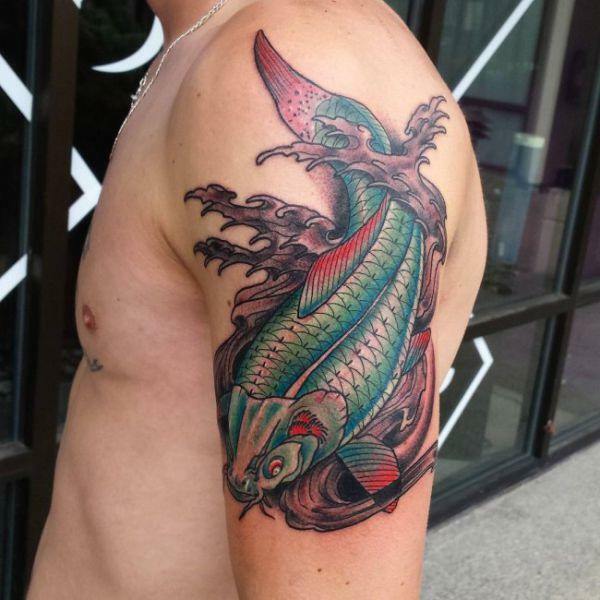 A twin fish tattoo is all about two fishes drawn upside down in a multi-color or a single color. 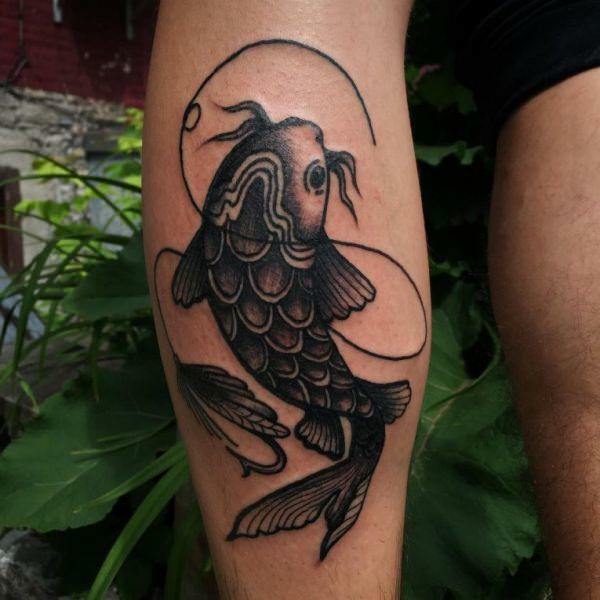 Visually enticing and different than the other fish designs out there, this tattoo design is the oldest portraying the star sign ‘Pisces.’ Engraving your initials inside the twin fish tattoo, can suggest your deep interest in astronomy. 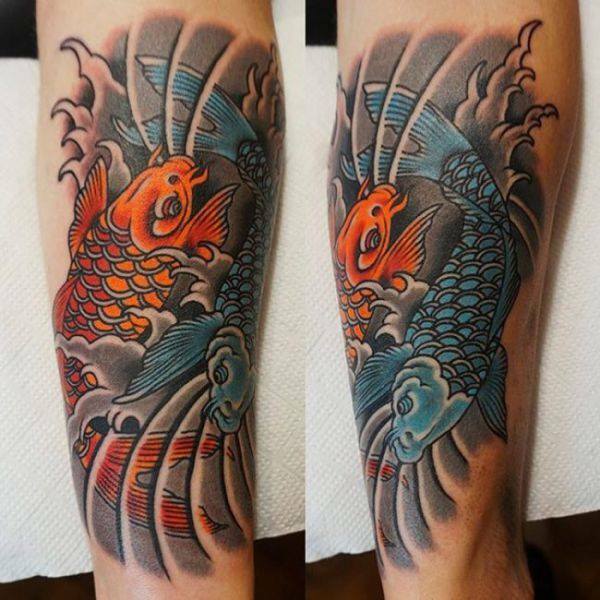 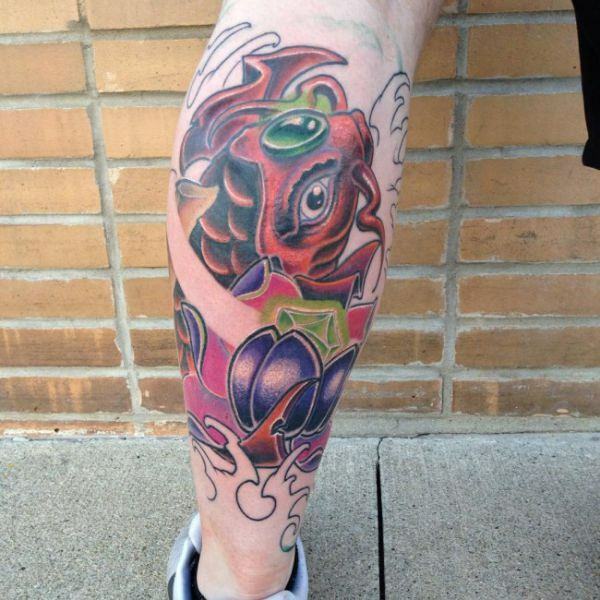 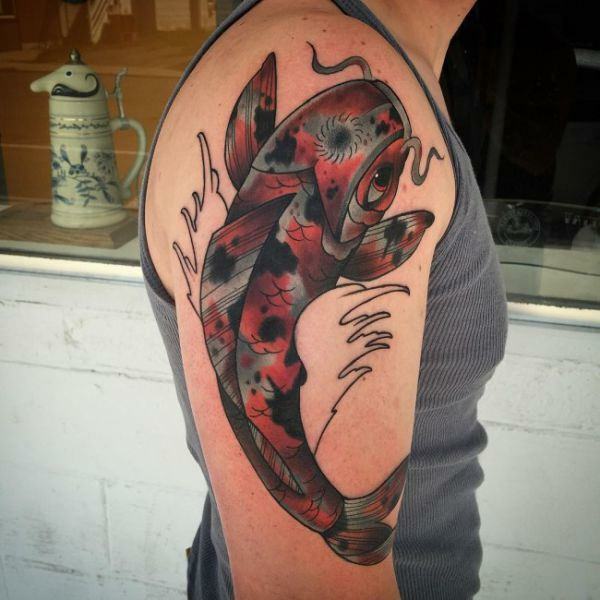 Abstract fish tattoos are famous due to their abstract design and unique choice of colors. 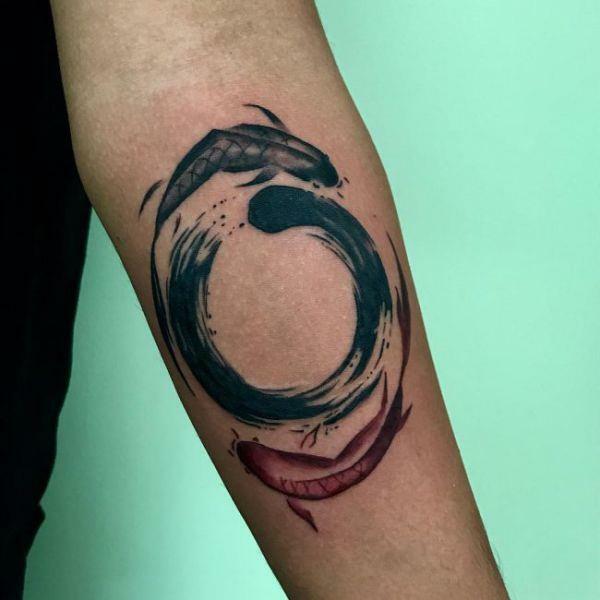 The design represents a meaning of oneness and ignores what the world thinks and speaks. 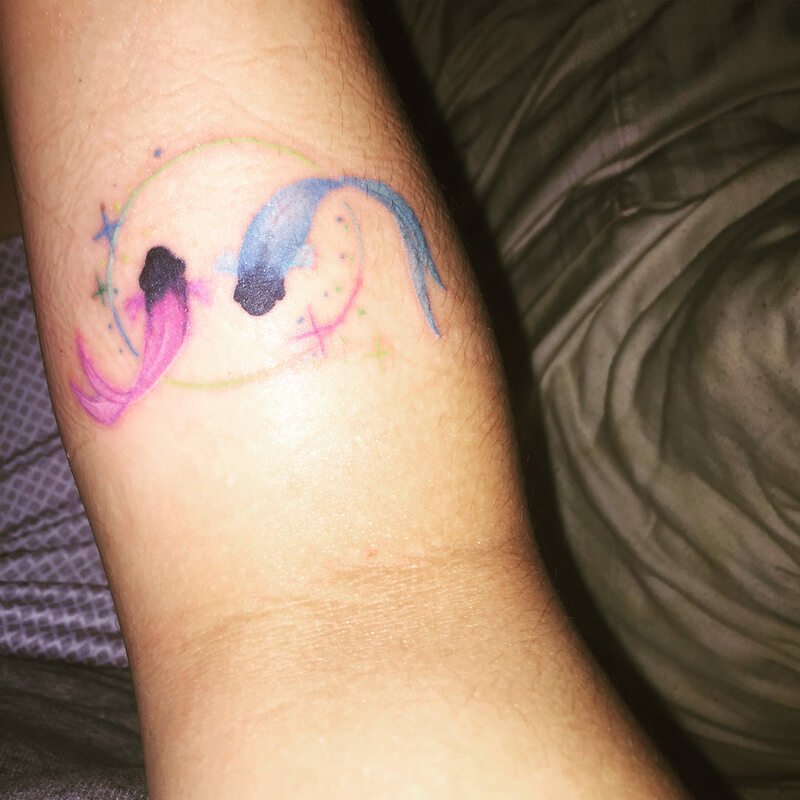 This tattoo is all about who you are and the choices you make in the world. 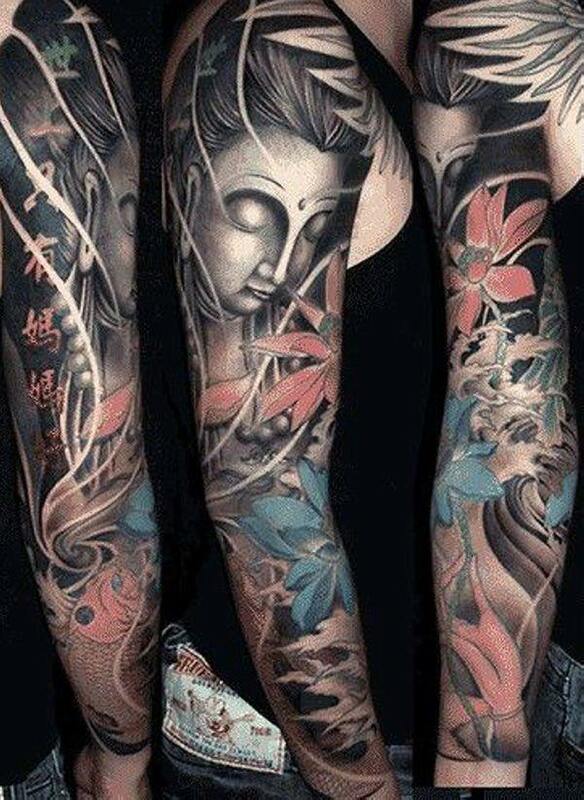 It is about ignoring all the negative energy and taking all the positive energy. 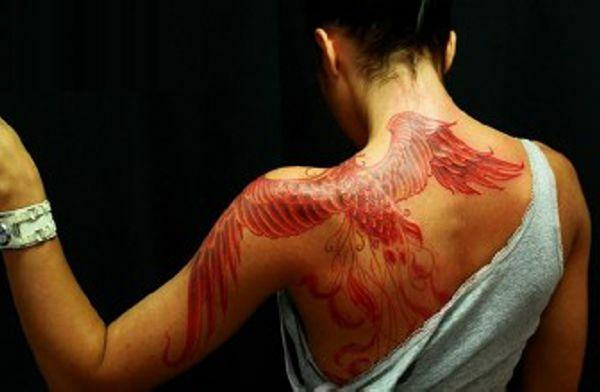 You can engrave this tattoo on a more substantial part of the body, preferably on hands, thighs or back. 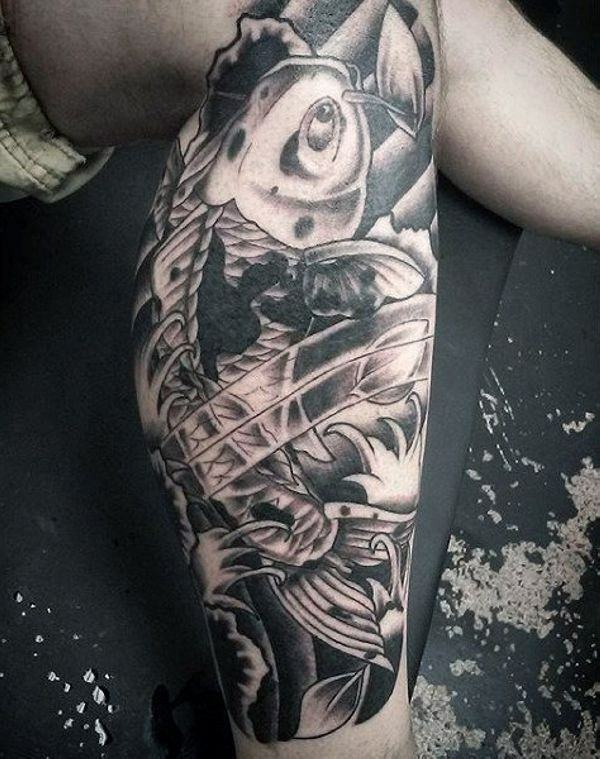 Classic fish tattoo sketches and designs are unique and extremely popular in the tattoo market. 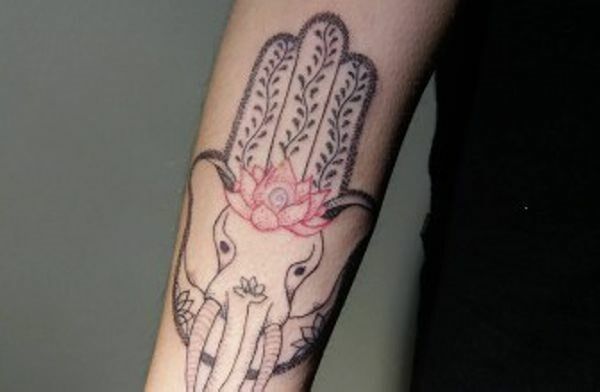 These tattoos are ephemeral and available in different colors, sizes, and shapes mostly in the form of stickers. 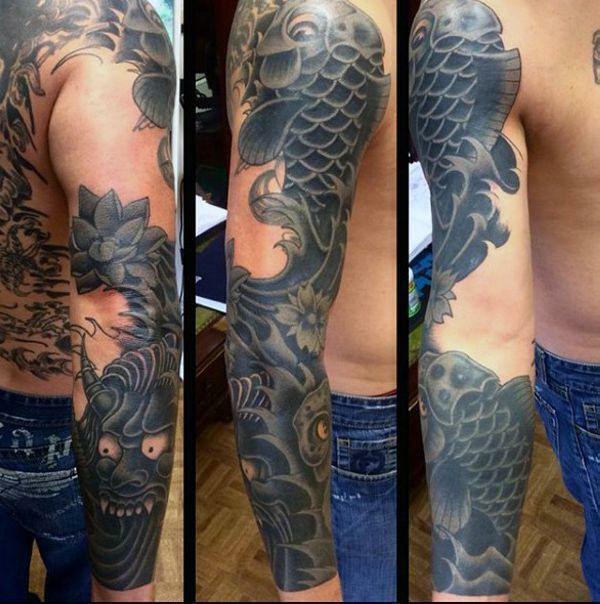 These temporary tattoos can be easily applied and removed without causing any inconvenience to your skin. 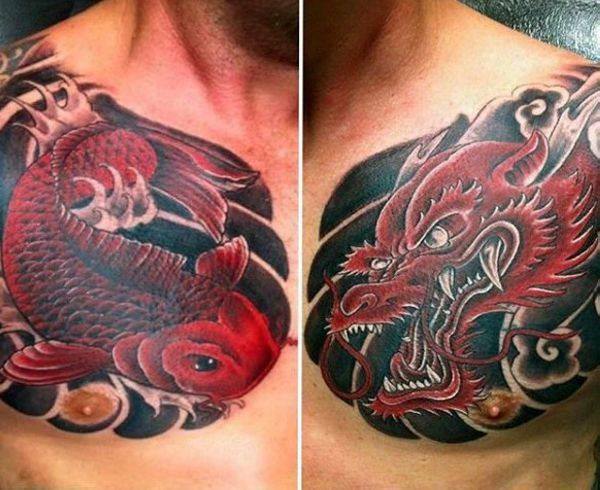 The best part about these tattoos is that you can apply it anywhere to give a more refreshing look. 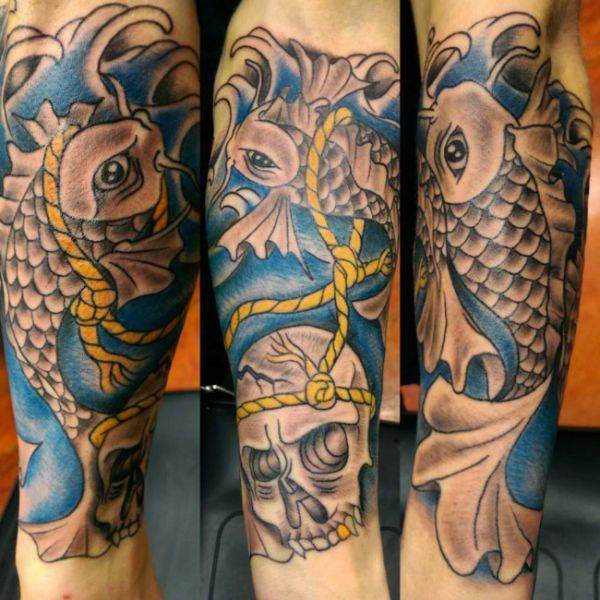 Some sketches and designs turn out to be beautiful and young, aspiring artists can easily create these designs. 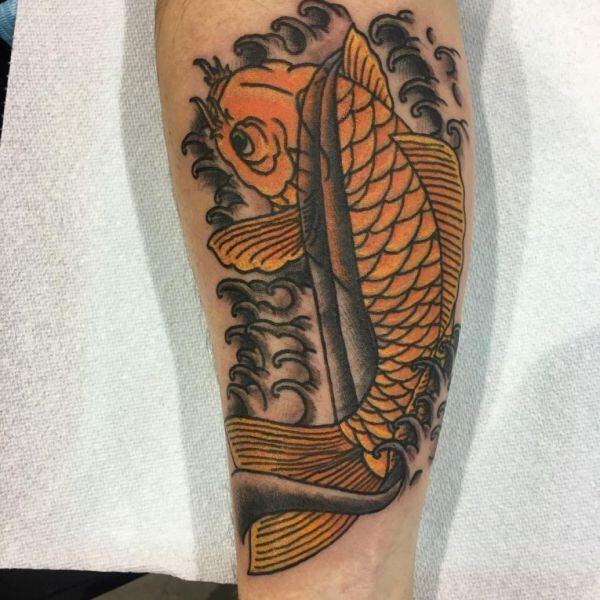 Besides adding colors, shades, and wordings, these simple fish designs look visually appealing. 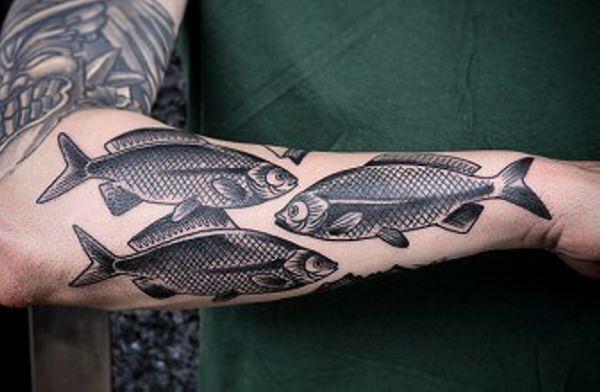 They can be sketched in many ways, for instance, if you like minimal design, you can create a design with fish. 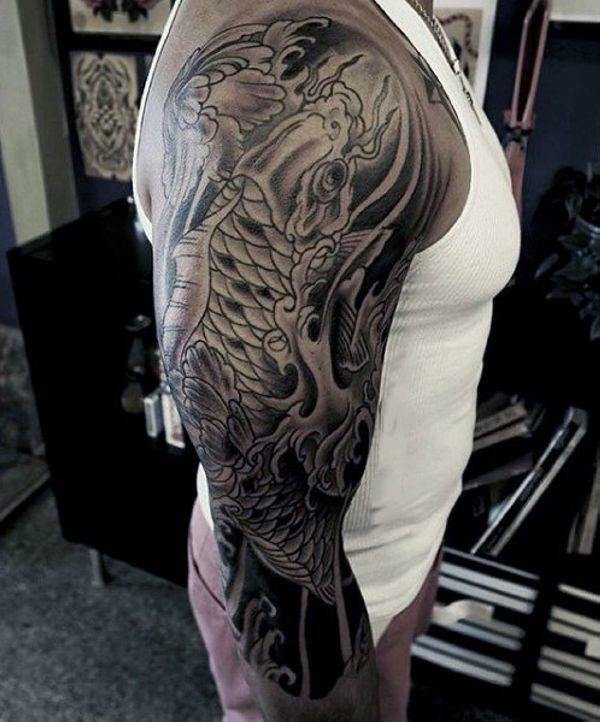 If you enjoy low and high polygon designs, you can sketch a tattoo with that design too. 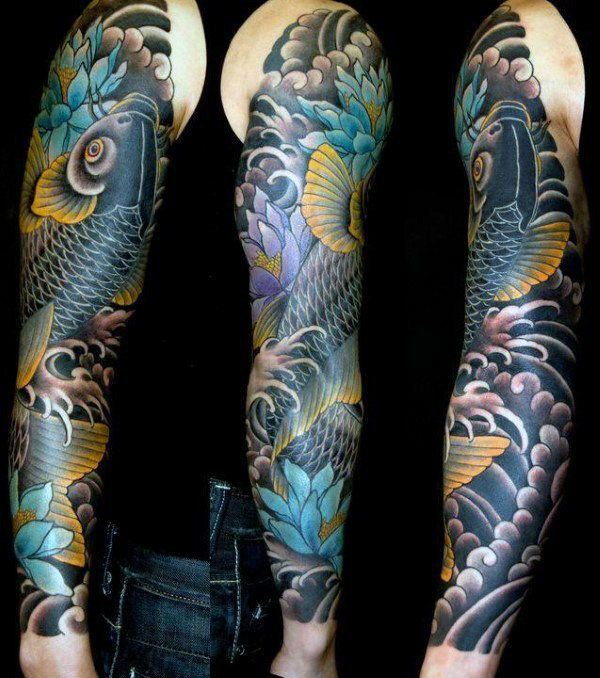 It’s all about being creative, and people who possess artistic abilities are the ones that get these types of tattoos. 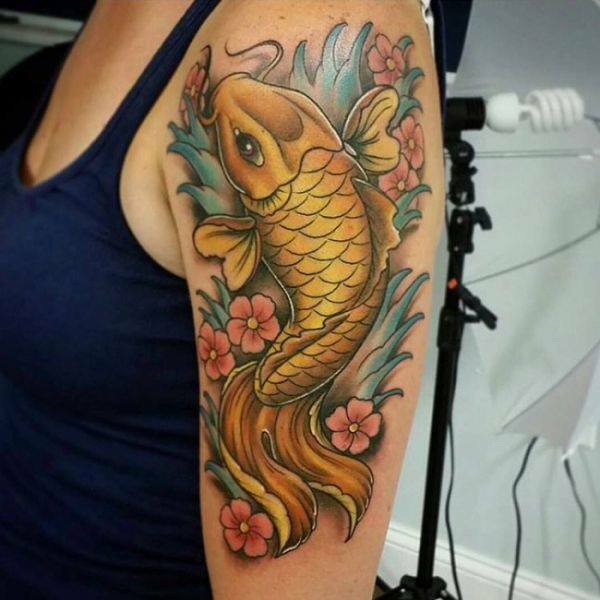 Besides creativity, a simple fish tattoo design also adds serenity and beauty to the tattoo. 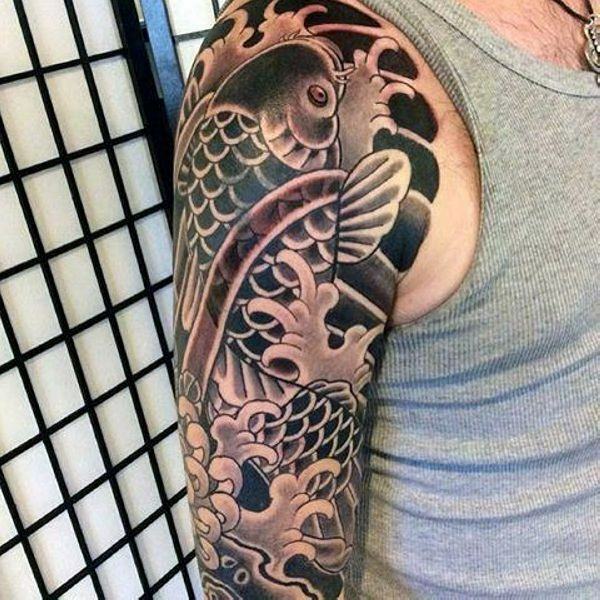 You can easily create this particular type of tattoo by making a band towards the arms. 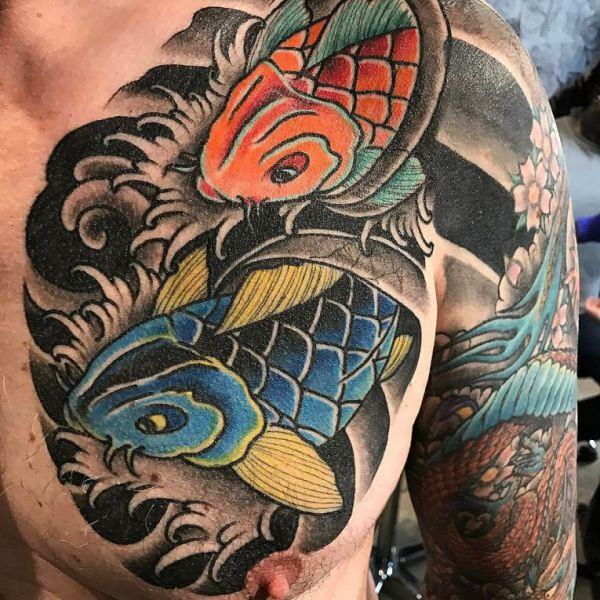 You can always keep the design simple by adding a single shade, but if you enjoy color and diversity, there are many options that you can explore. 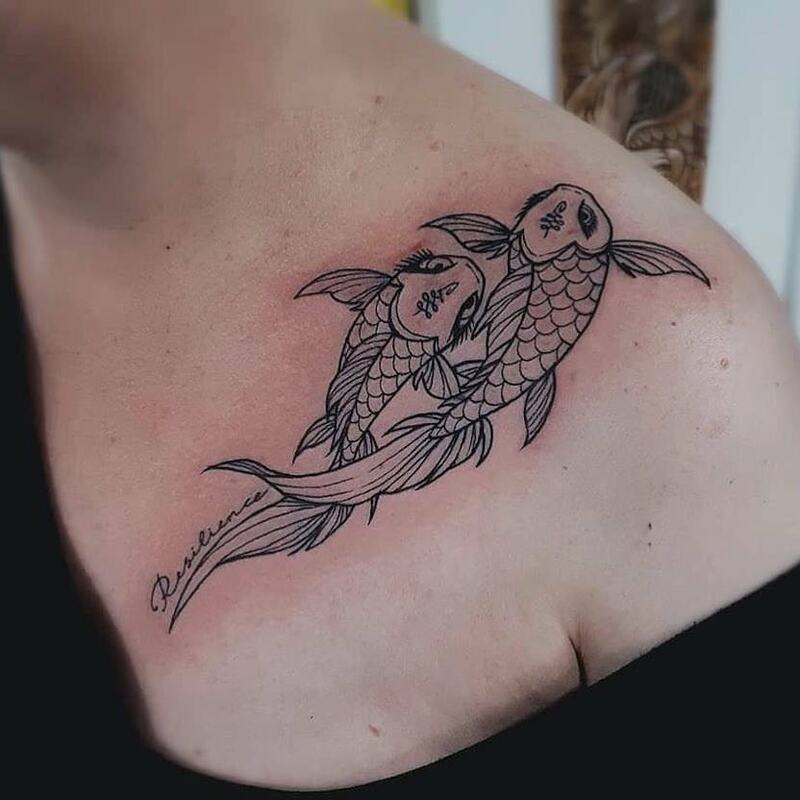 Popular among females, this tattoo design is for people struggling with different issues and finding a way to deal with their problems. 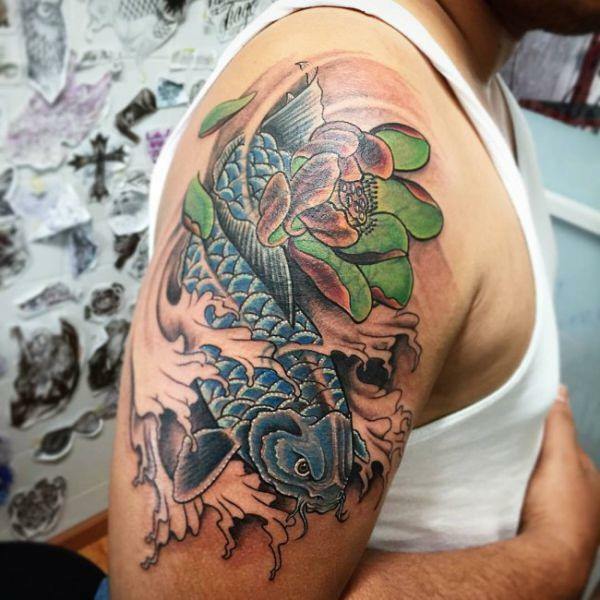 Two-tone shades or multi shades improve the design and add flavor to your tattoo. 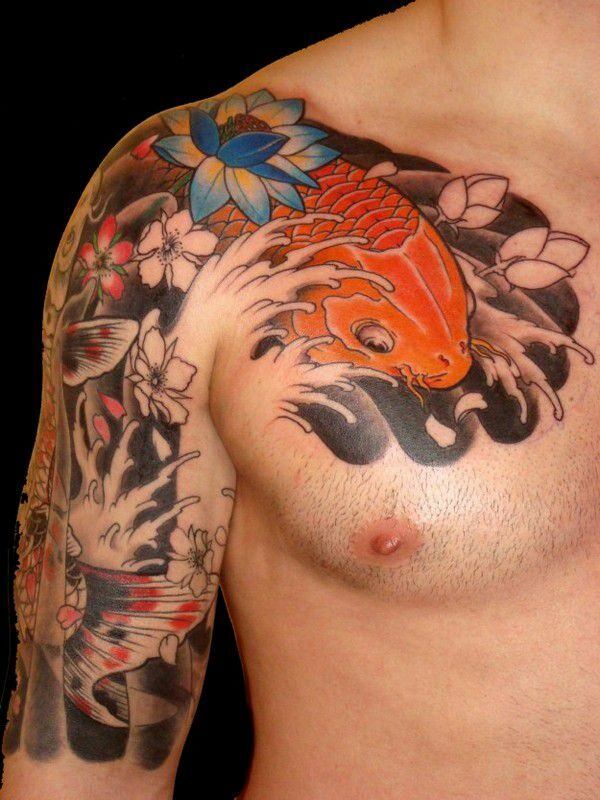 Popular among people of all age groups, 3D tattoos are most loved and liked by a large number of people. 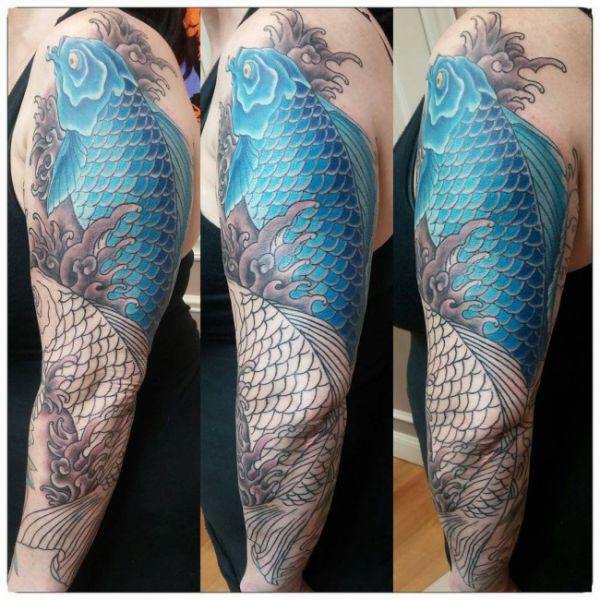 3D fish designs have a sizeable female following and sketched mainly by people that appreciate art and design. 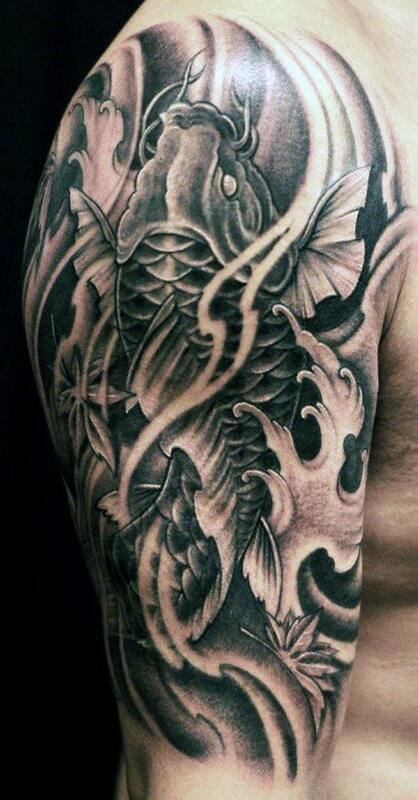 This particular type of tattoo has no age limits, personality traits, etc. 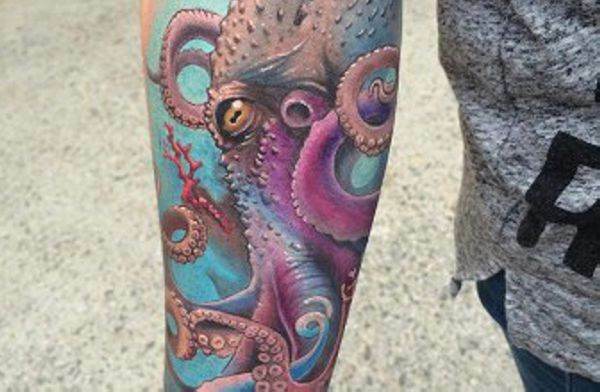 Anyone from any age group can get this specific type of tattoo. 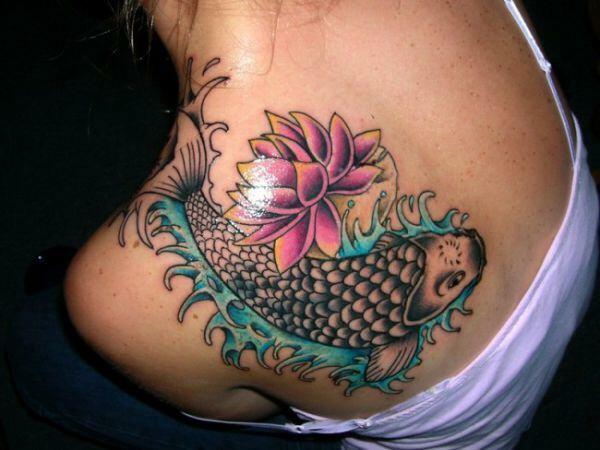 Radiant design type tattoos are popular among people that like bright color and designs. 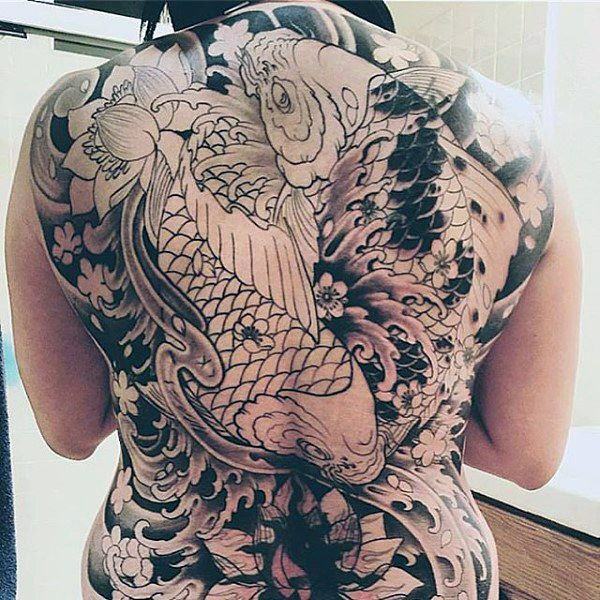 The best part about this design is that it is visibly attractive. 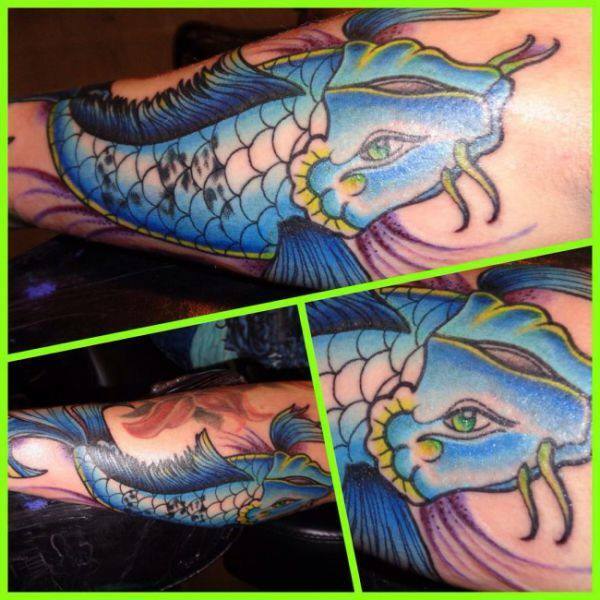 This tattoo is an ideal fit for people wanting to get the tattoo a little more bright and colorful. 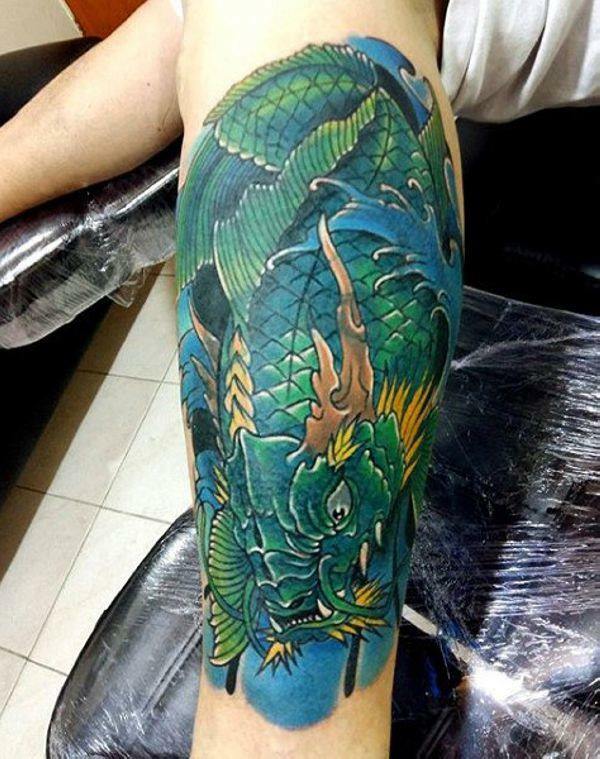 Radiant tattoos are quite bright and most suitable among young people. 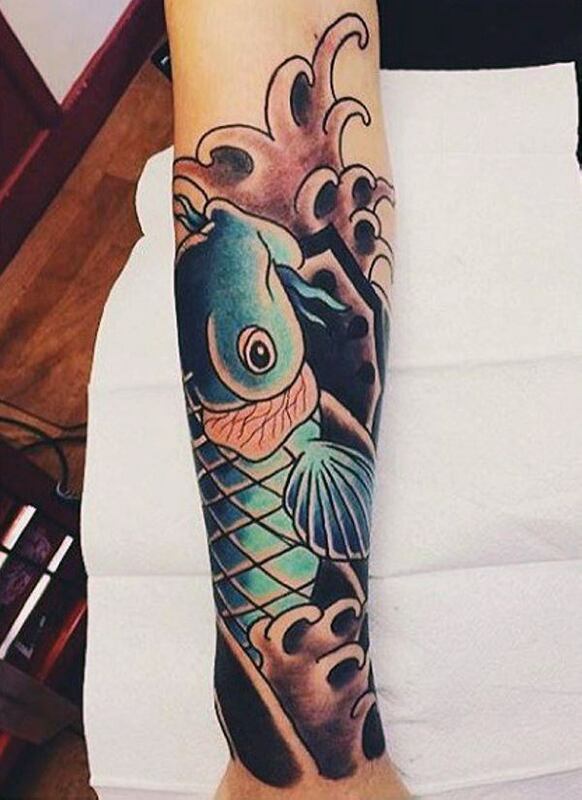 Moon and fish design is a deadly combo in a tattoo. 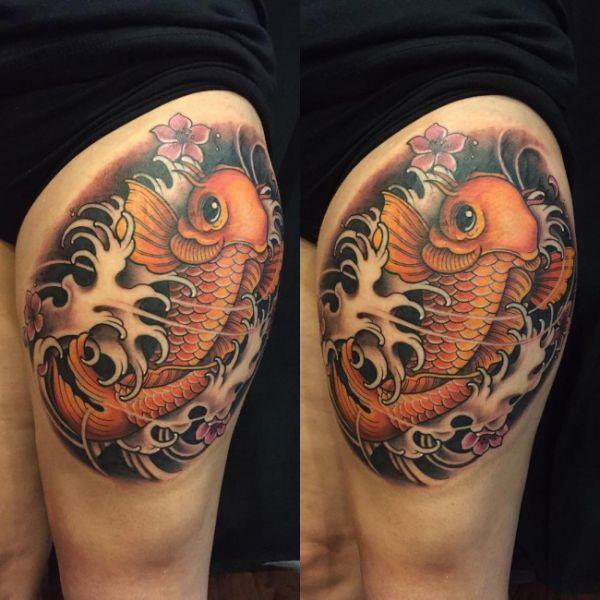 This beautiful tattoo is portraying a dual image suggesting that every coin has two sides. 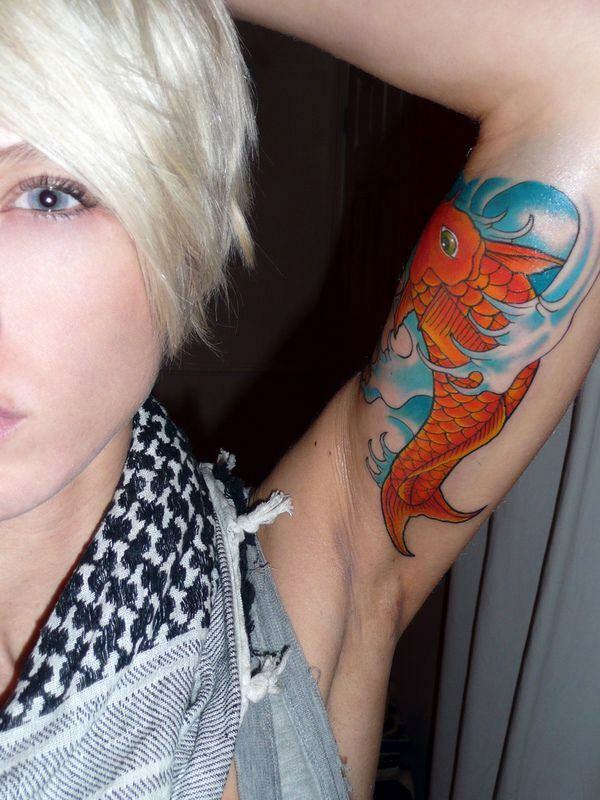 It’s about how we perceive and take it – either positively or negatively. 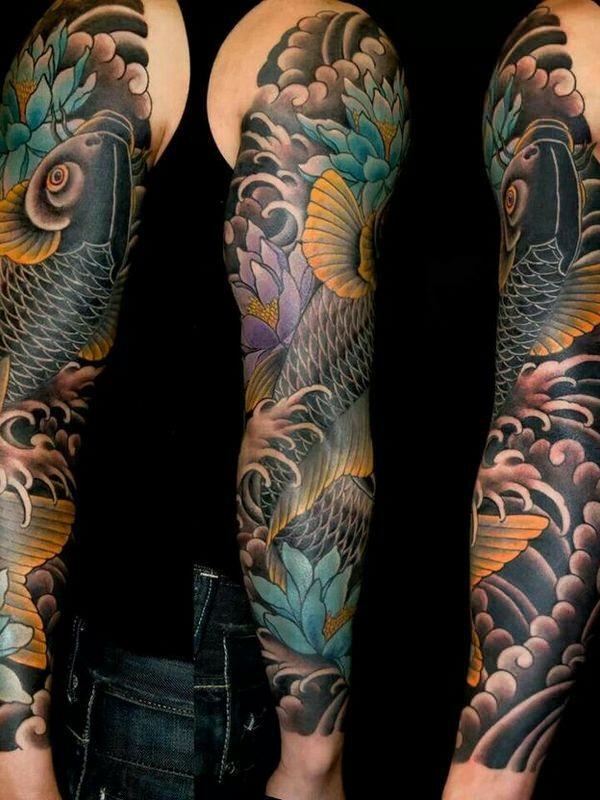 The moon, on the other hand, enhances the overall beauty of the tattoo. 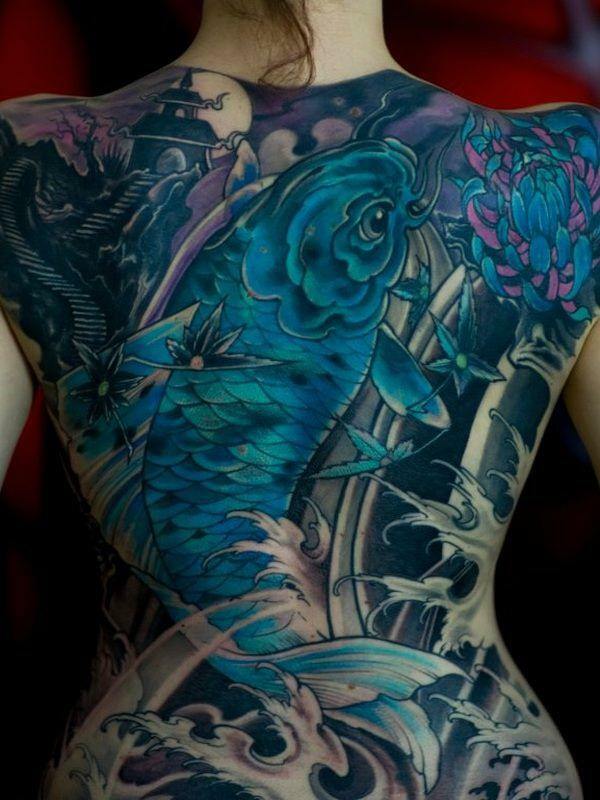 As discussed earlier, fish and floral designs enhance the look and visibility of the tattoo. 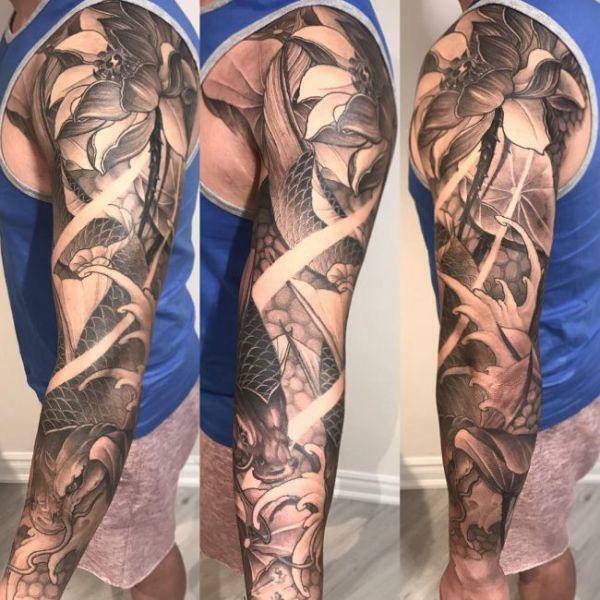 The designs are fresh, unique, and provide an appealing look. 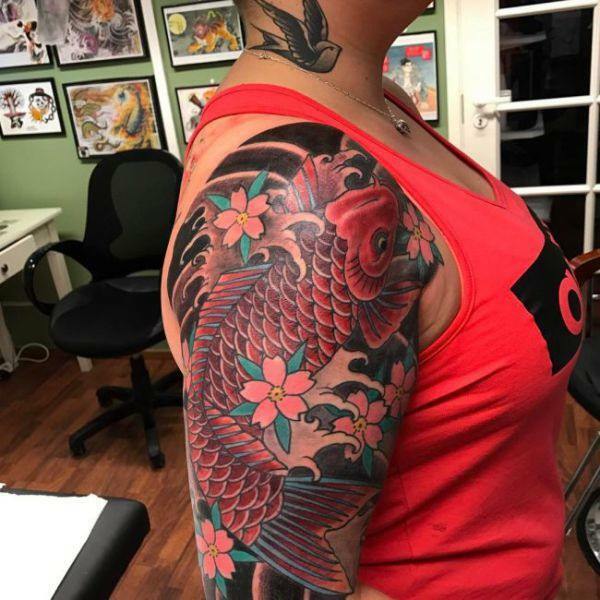 Normally, this particular type of tattoo is big in shape and size, the colors, shades, and tones add extensive variety in the design. 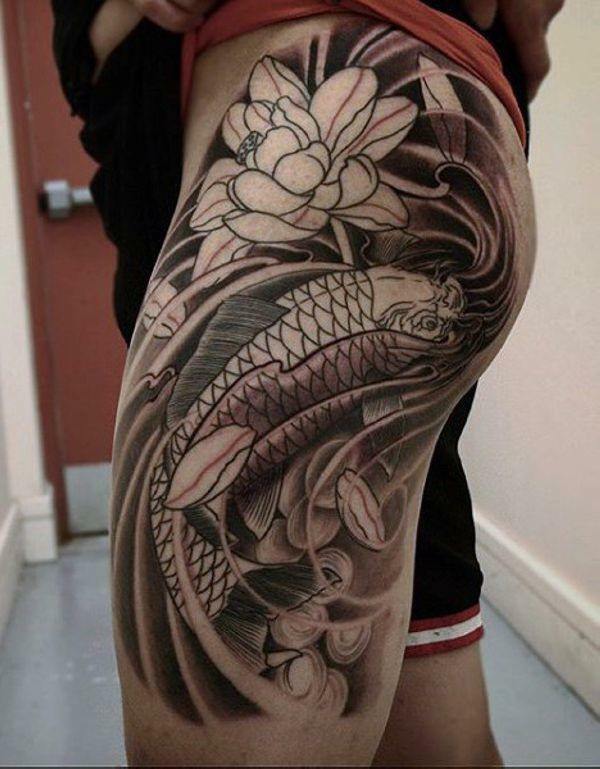 Popular among females, you can engrave this tattoo on the back of your body or your thighs depending on your preference and taste.